It’s not everyday – or every year for that matter – that one can splurge and enjoy life as it should be. This year, Rhex and I decided to spend our 4th anniversary in Paradise. We promised to each other that we will spend all our anniversaries in the Philippines because we owe it to ourselves and our own country to fall in love with it along with us celebrating our own love. Last year, we drove all the way up north visiting Ilocos, La Union and Baguio. 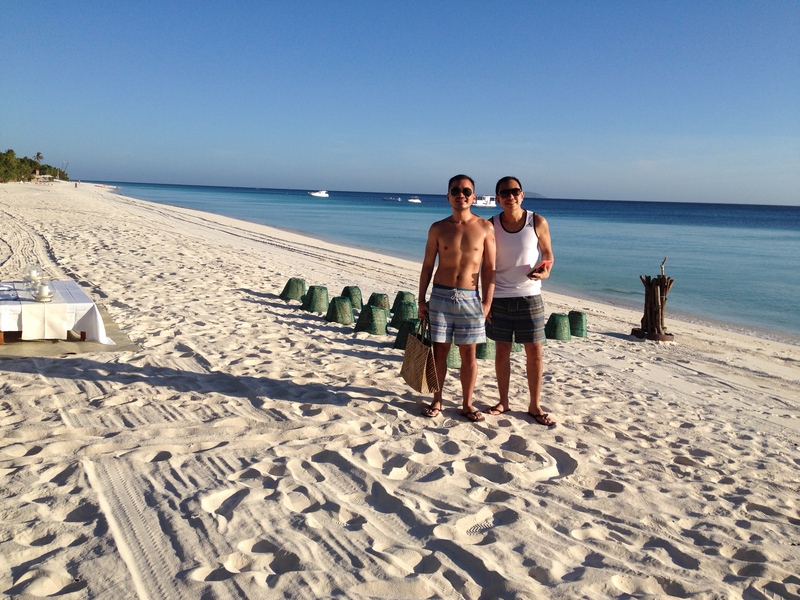 In 2012, we went to Panglao and in 2011, we spent our anniversary in Shangri-La Boracay. 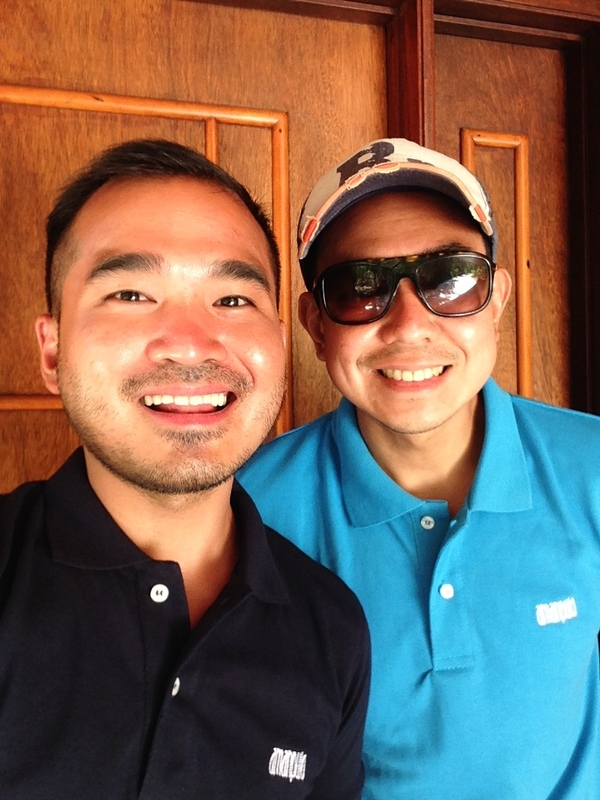 This year, we chose to spend it in Amanpulo given that neither of us has been to Palawan and that we were just so intrigued by it having heard of so many so-called myths about the luxury resort, known to many as one of the world’s best beaches and widely regarded as one of those places to see before kicking the bucket. 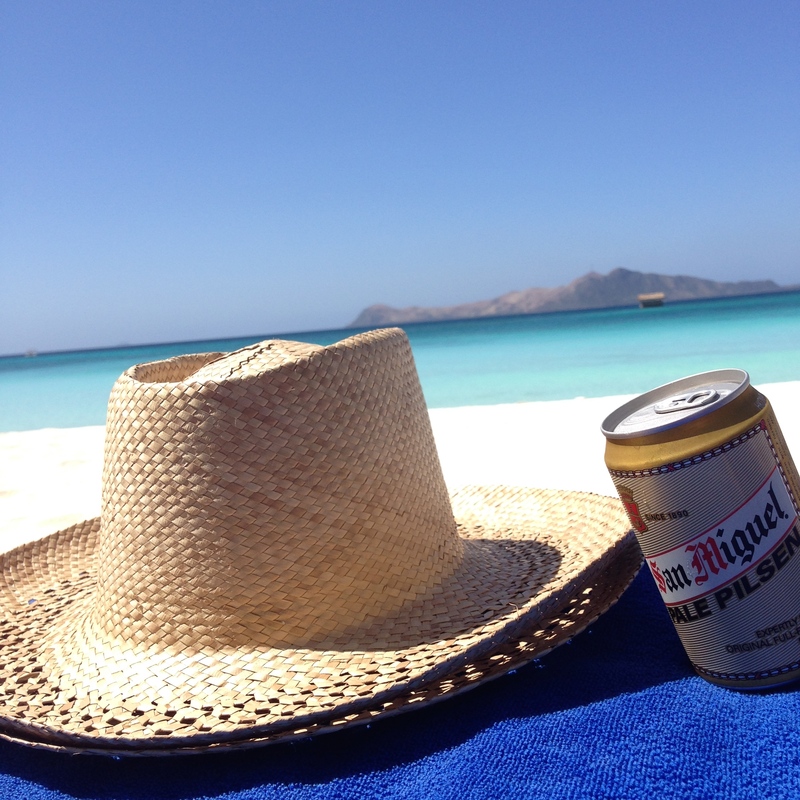 We didn’t have to research much about Amanpulo because there are so many “myths” about that circulate around some friends who have been there and some who have heard from their own grapevines. We were just so excited to be there; I for one had a couple of sleepless nights the week prior our trip which I charged to my growing anticipation for what Amanpulo has in store for us. Rhex and I even wondered where we would go next year or the year after next given we’ve already been to Amanpulo — and this was a discussion we had even before we got our feet on the island. We already knew that it would be the best experience yet for us in our own country. The thought makes us proud of our own country; the best Mother Nature has to offer is right under your nose. It is accessible but with some considerable splurging required. Rhex was coordinating our booking directly with the reservations manager, Jane Delgado, whom I also contacted via email for my last minute requests which were largely around setting up the casita for our arrival to surprise Rhex with a bubble bath, wine, and some. Jane was very accommodating, professional and always accessible to us via email and phone calls. Much of the prep work was covered by Jane and that only roused even more anticipation of what Amanpulo has in store for us. 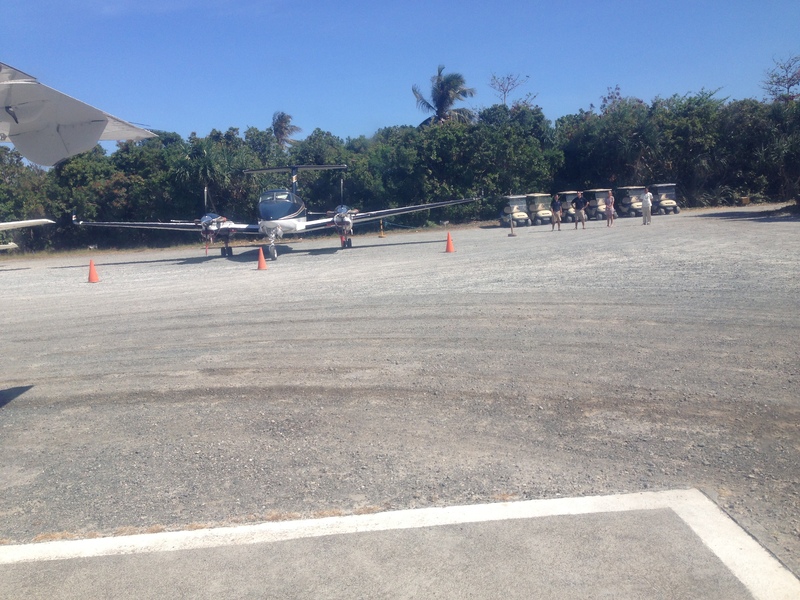 We went to the Amanpulo Departure Lounge at the Island Aviation hangar near the old domestic airport. 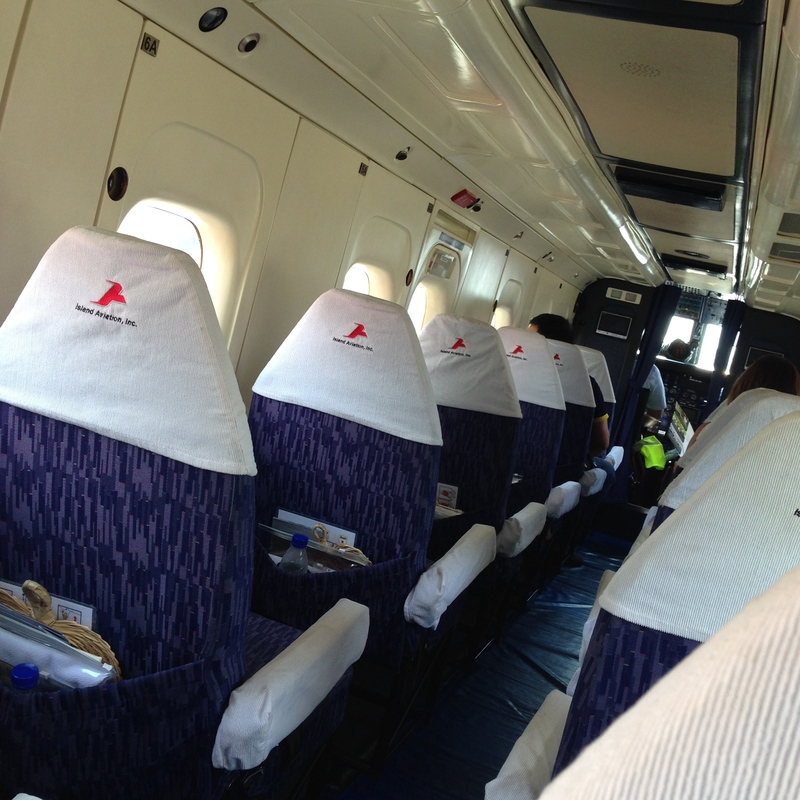 To go to the island, you need to take a chartered flight which is already included in the reservation arrangements. You go through a short security baggage check and you are ushered straight to the lounge by the ground staff. We were offered drinks and some bite-sized snacks. Someone from the staff approached us to ask if we would like to leave earlier since the plane was ready. Of course, we said yes. I am assuming the rest of the guests also said yes. 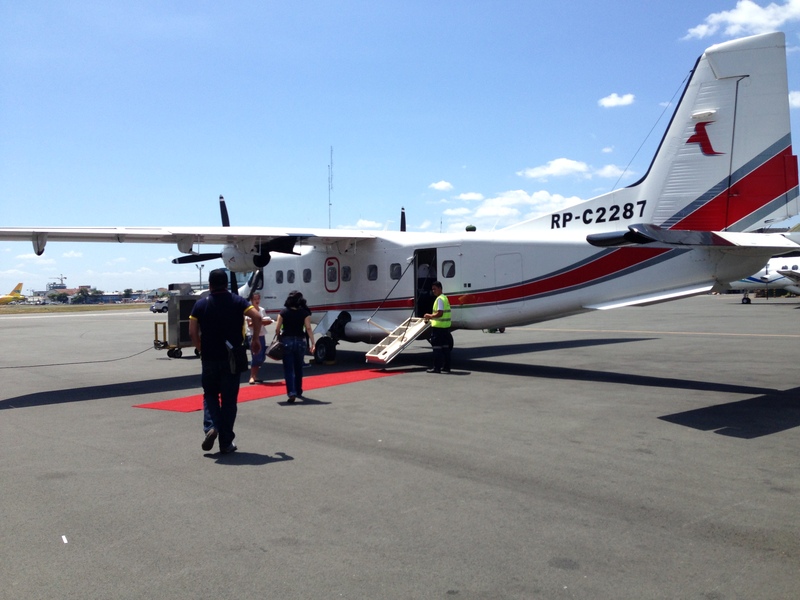 We were then ushered to a small 19-seater Dornier plane. And this is where the experience begins! There are only two rows of seats separated by an aisle. We chose the seats second to the last row since these were not separated by the aisle. 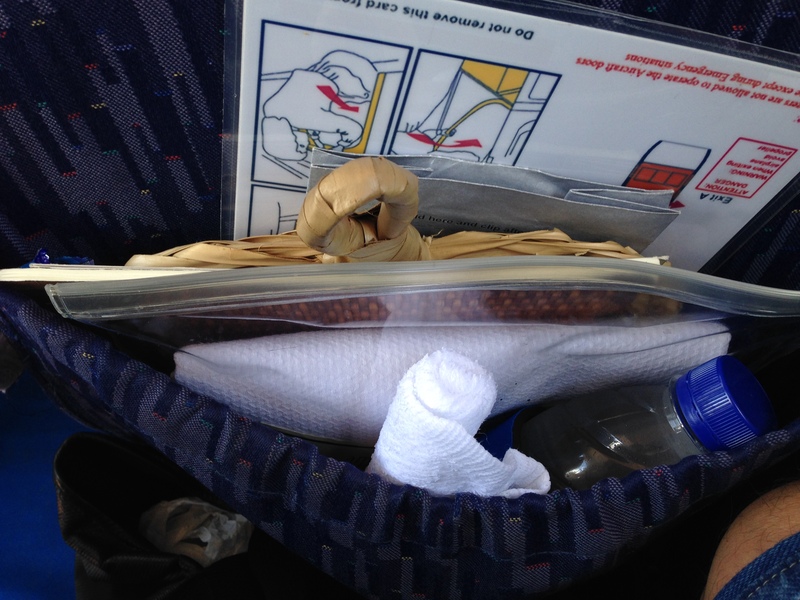 Each passenger has a fan, a frozen towel, a kit containing earplugs and a blanket. We kept on thinking whether the frozen towel is Mary Ann Tayag’s idea as she would serve the same at Bale Dutung. The front pocket also has an in-flight guide which shows you the map of the Philippines and the approximate view from the plane as it flies from Manila to Amanpulo. 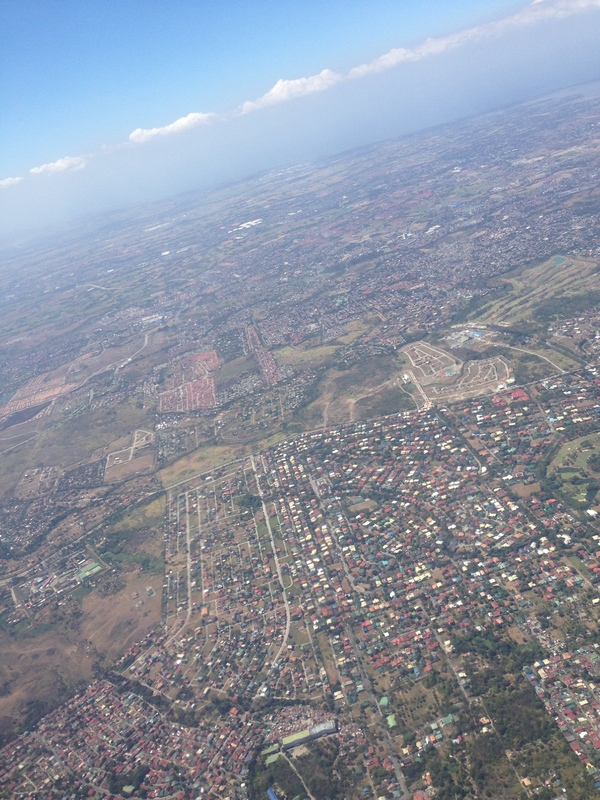 Manila does not look from above bad at all even in daylight. 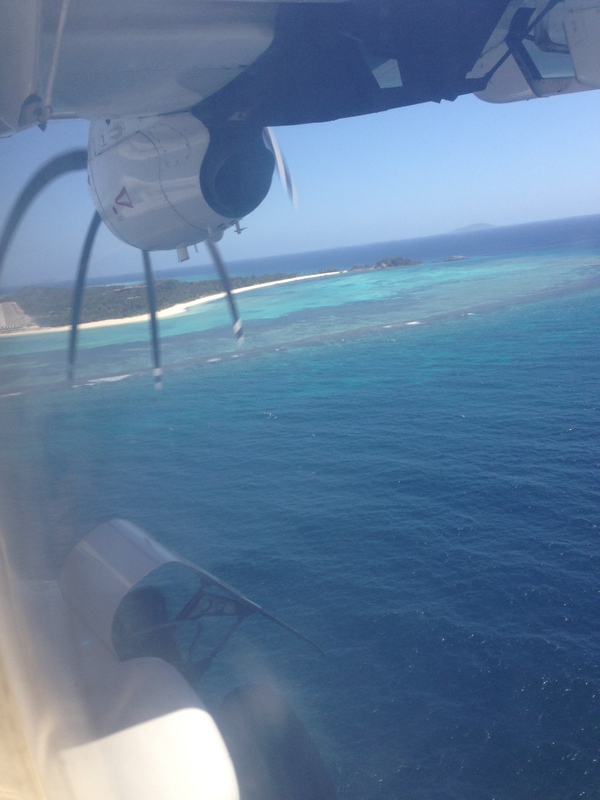 And after about an hour, the plane begins to descend to Pamalican Island where Amanpulo is. The resort has its own airstrip which you can clearly see from the plane. 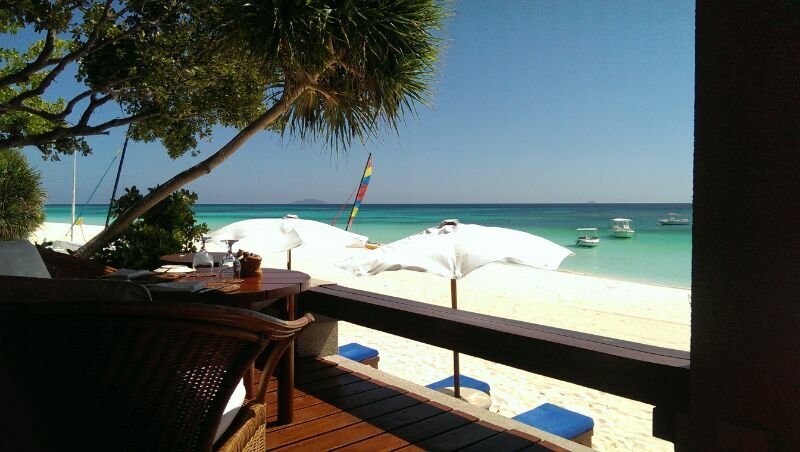 And the cobalt blue water and white sand beach are already in view as well. Upon arrival, we were greeted by our guest assistant who addressed us by our name. We were wondering how the guest assistant knew who to address ‘Mr. 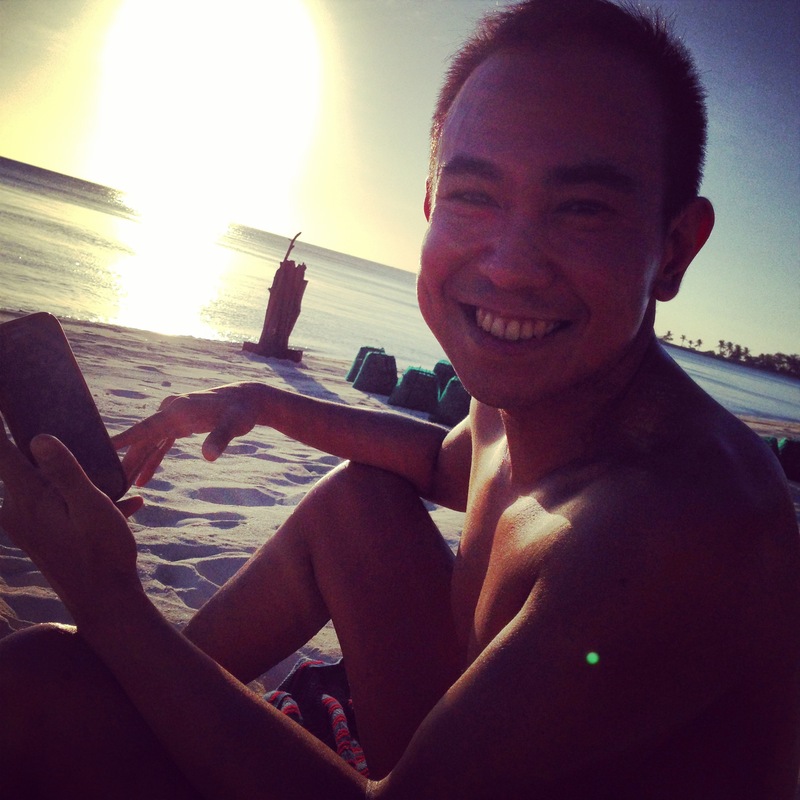 Rhex Santos’ and ‘Mr. 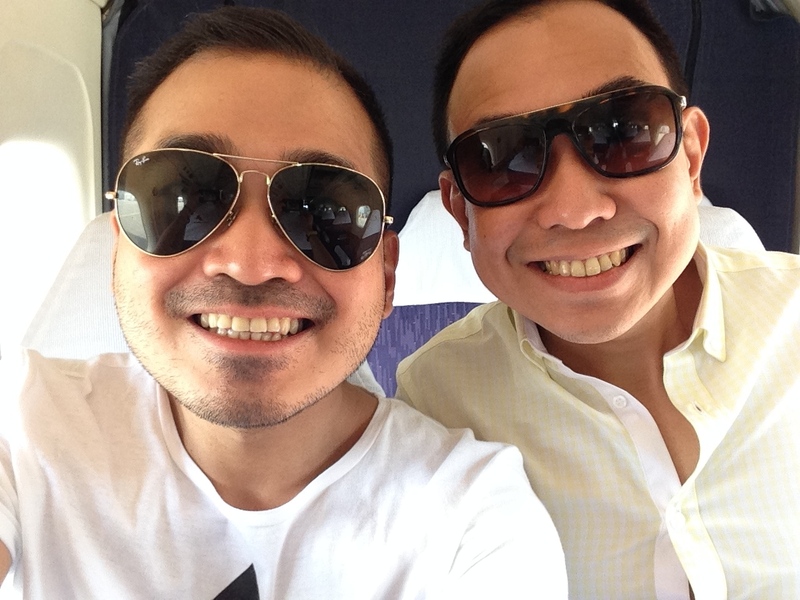 Pao Peña’ to when he was welcoming two guys. It is much easier to guess when you have a male-female couple because it is almost obvious who Mr. and Ms. would be. We realise that the trick to it was the ground staff in Manila asking for IDs which we think were scanned and sent to the staff in Amanpulo. 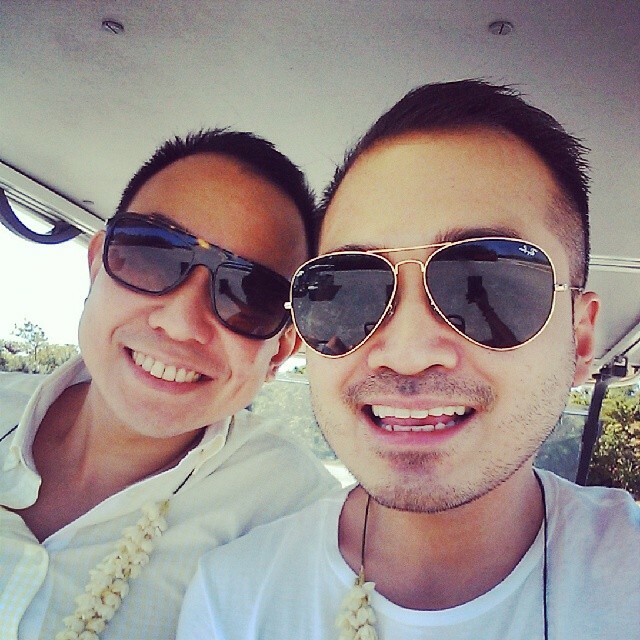 We were then presented with sampaguita garlands and led to our Club Car (buggy). 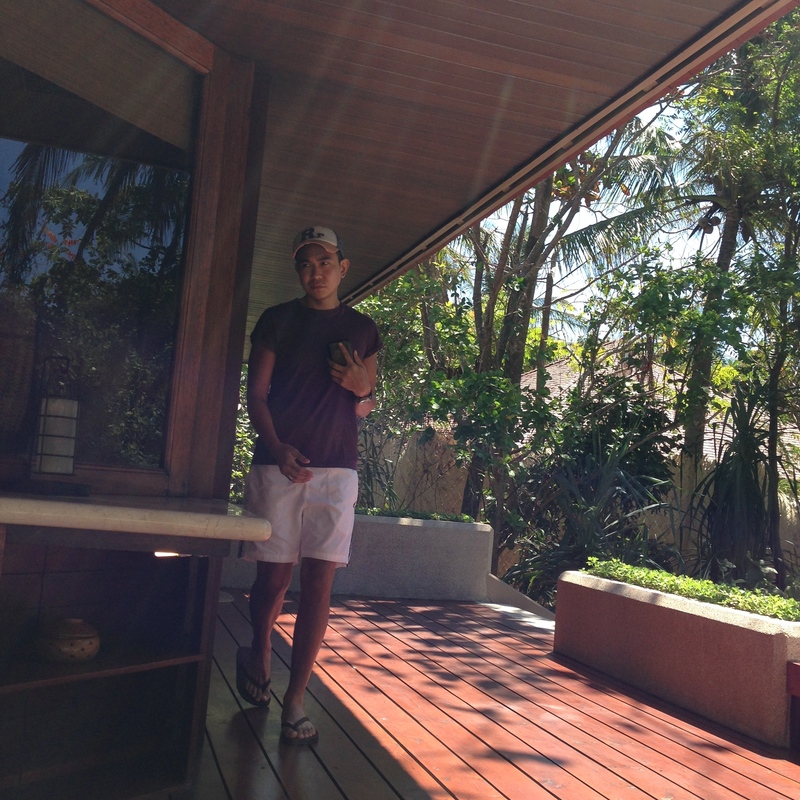 Jay offered to tour us around the resort; we were shown where the Aman Spa, the restaurants, the Beach Club and the Clubhouse were. Jay led us to the Beach Club for lunch where Rhex and I had some tapas and beer (we were just that thirsty for something cold!) and there we had our first look of the beachfront. How beautiful. 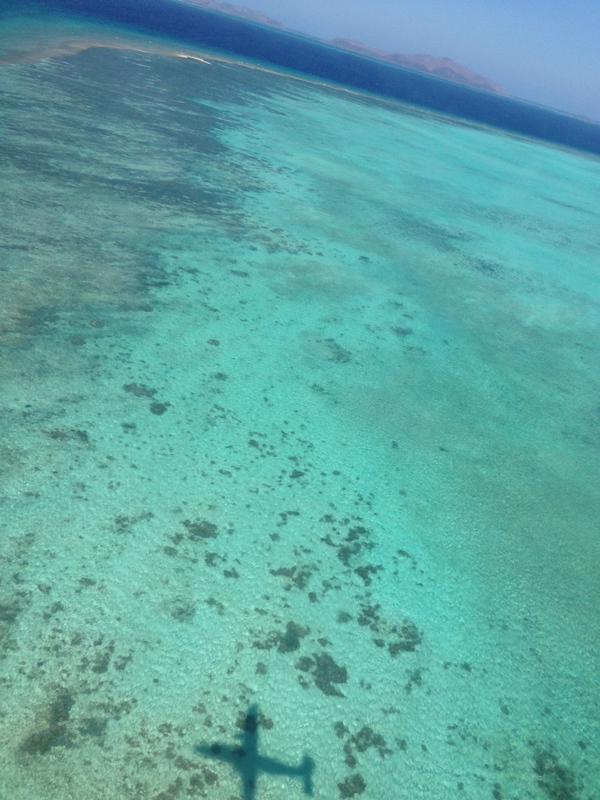 An almost borderless see flanked by a couple of islets and the Manamoc Island, the host community of Amanpulo. Then we were driven to our room. He also handed the keys of the casita and the Club Car. Each casita has its own Club Car for independent exploration of the island. 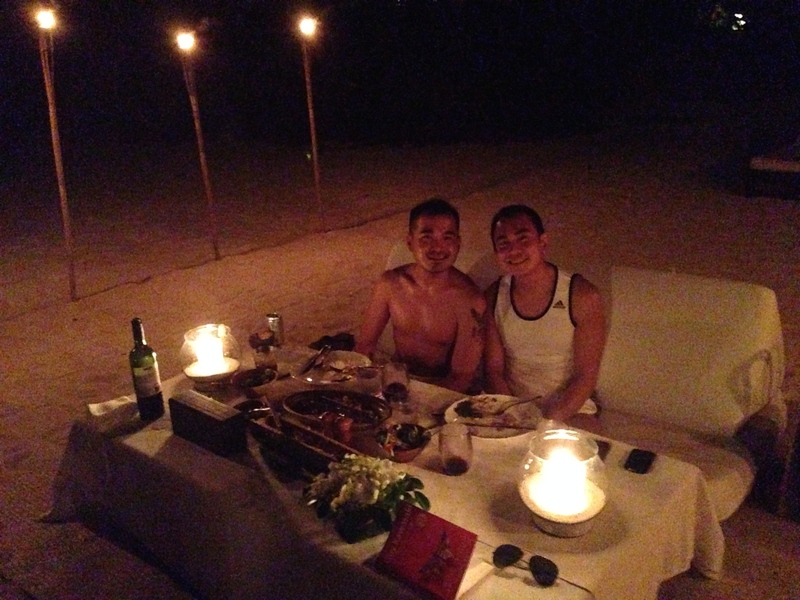 He let us into our beach casita. We were upgraded for free from a treetop casita to a beach front casita since we were staying for three nights, four days. He opened the door and let us in. We noticed his big smile, the excited kind, in anticipation of our delight and surprise to see what they had prepared for us. 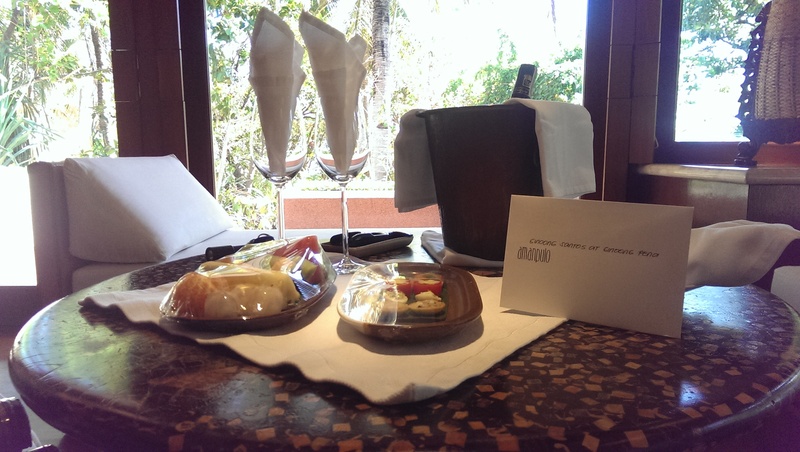 On the dining table were some hors d’oeuvres, a bottle of white wine, fruit plate, a handwritten note from the staff. 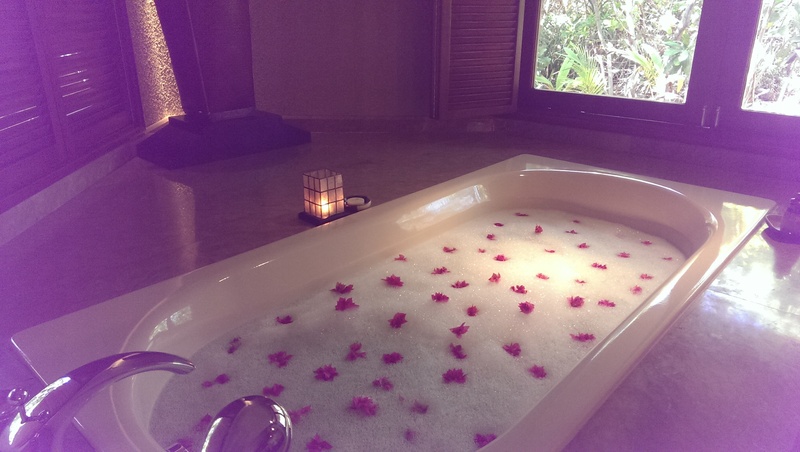 The bath tub was prepared for a midday soak which was decorated with bougainvillea flowers with water still warm adorned by lit candles. The entire place was perfect. We thanked Jay and told him how delighted we were; he was delighted himself then we were left alone to enjoy their sweet surprise. After taking advantage of the bubble soak and one bottle of wine, we got out of our casita and headed to the beach. Each casita has its own private access to the beach. There’s also a personal hammock you can use right by the beach. Just right outside our casita, staff were already preparing for the private barbecue dinner we had reserved for our first night. 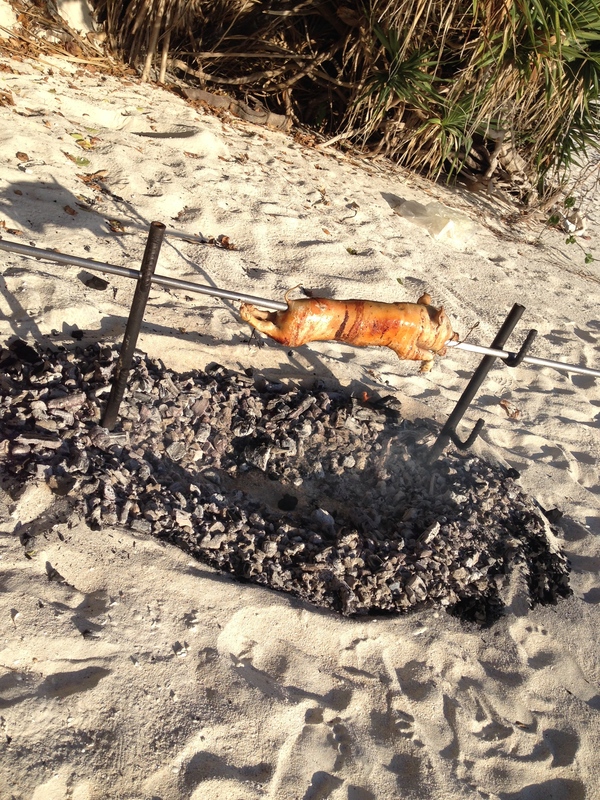 We chose the lechon menu which features a 5-course dinner with your own lechon de leche as the highlight. The suckling pig was just right in terms of size but we knew that was way more calories than we could chew on. We had enough time to bask in the afternoon sun since dinner was scheduled at six in the evening, just right after the sun sets. Aside from the staff preparing our dinner and the ones in the boats clearing up the horizon, there were no other people in sight, not even the people we saw in the plane on the flight to the resort. You could even go skinny dipping in broad daylight and not one soul would care. The island felt so spacious despite it just spanning five kilometres long. Sun began to set at 5:30PM. We were then cued to take our seats at the special dinner they set for us. 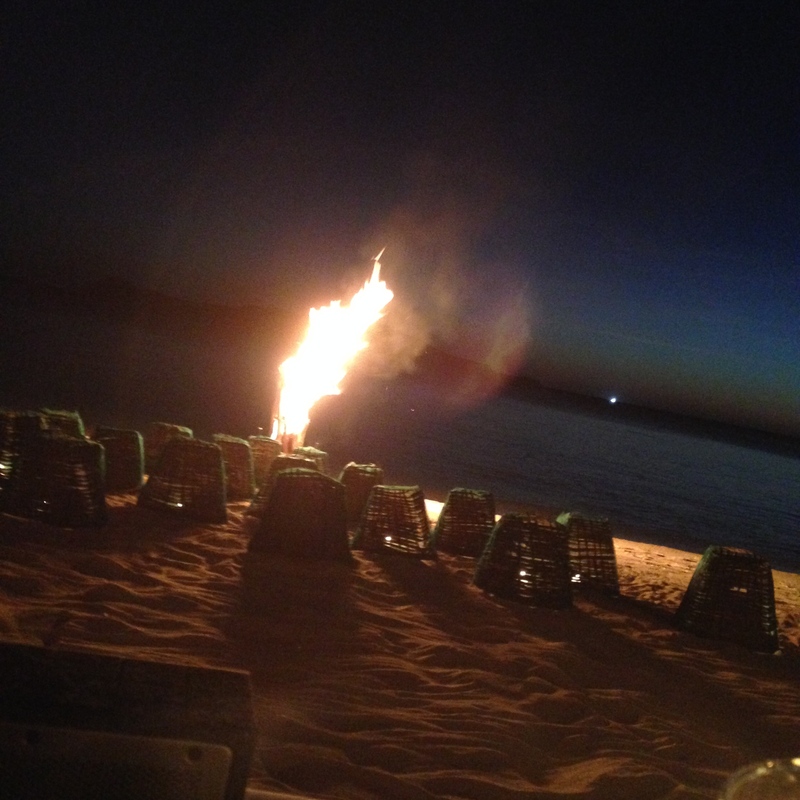 And as the sun set slowly in the horizon, one by one, candles and a bonfire were lit by the staff. 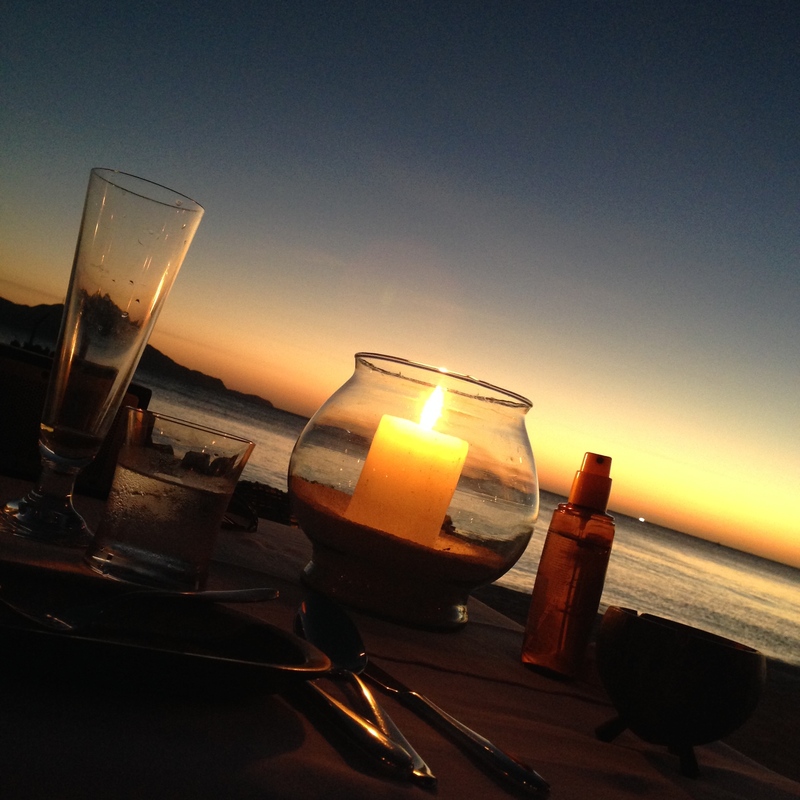 It was like watching a turndown service live only that this one was to prep you for a special, candle lit dinner by the beach. Food was great — especially the thin, crispy lechon skin served as appetizer — that I have totally forgotten to take pictures of the food except for the lato salad we were served. Towards the end of the meal, the staff surprised us with a Happy Anniversary cake which was perfect with the red wine we chose. The staff offered to cook our leftover lechon as sinigang for lunch the following day. I thought that was a nice touch; there was so much lechon we didn’t eat and what a waste it would have been had they not offered to reuse it for another dish! 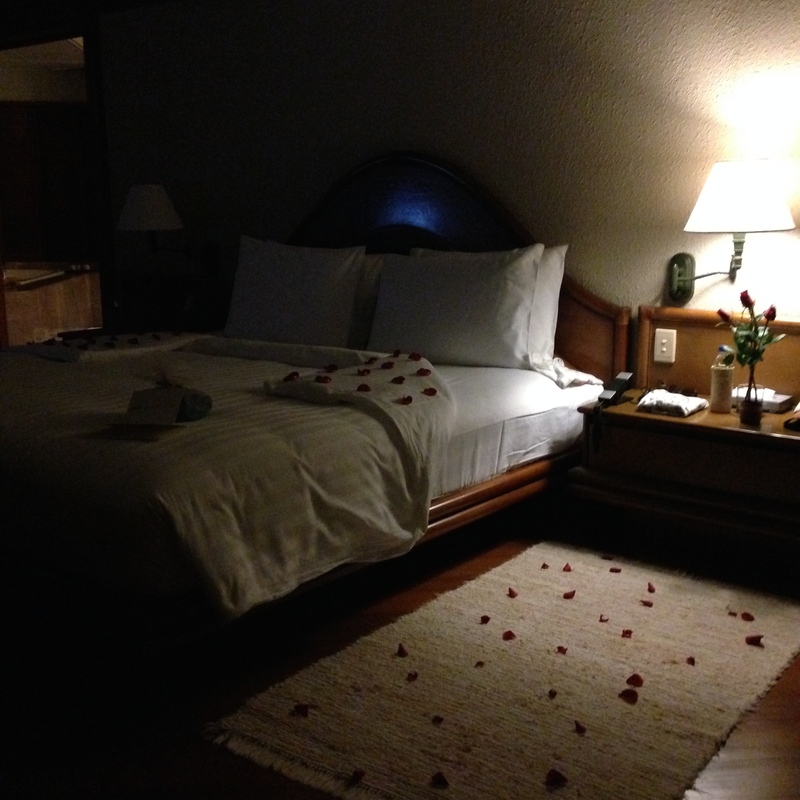 As expected, when we got back to our casita, they had already done the usual turndown service with all the blinds shut, ice bucket refilled and wine glasses ready for use, the bed set for the night with a touch of something sweet. This is very similar to the Shangri-La Boracay’s turndown service but the difference is that Shang once gave us bookmarks on each side of the bed which we also thought was also a nice touch. We woke up early the next day not sparing hours away from the much needed tan and R&R. 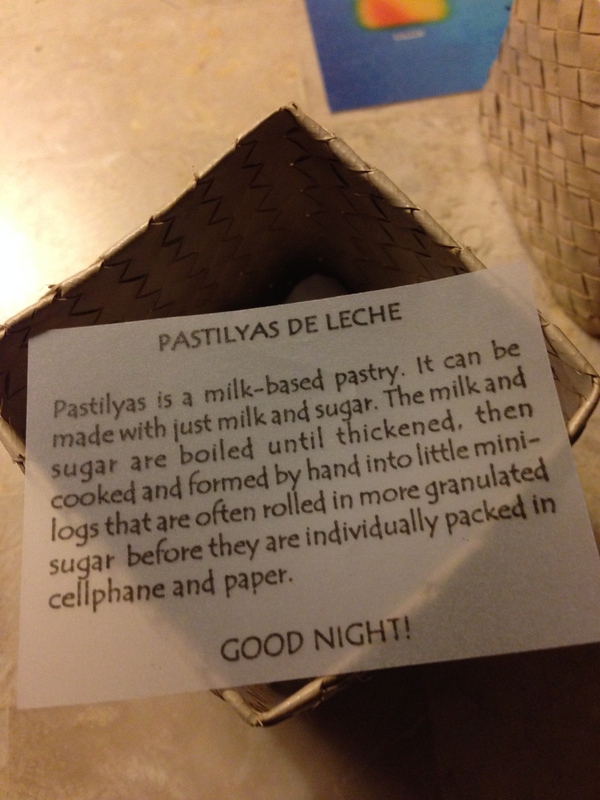 Each casita has its own Nespresso machine. So made our coffee and enjoyed it at the sun deck of our casita. It has a view of the sea, peaking through the trees that surrounds the casita. Here’s a quick tour of the T&B which is almost as big as the bedroom. Tandem vanity, a dressing area, stand-alone shower, a tub. 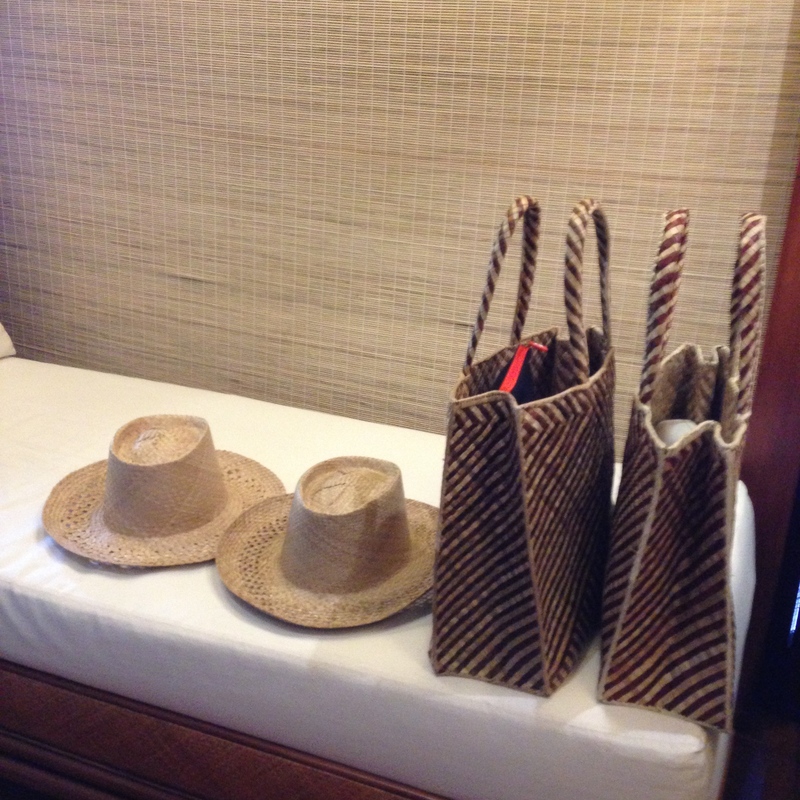 Guests are also given a beach bag and hat which also serve as your souvenir. These were made by the community in Manamoc Island. 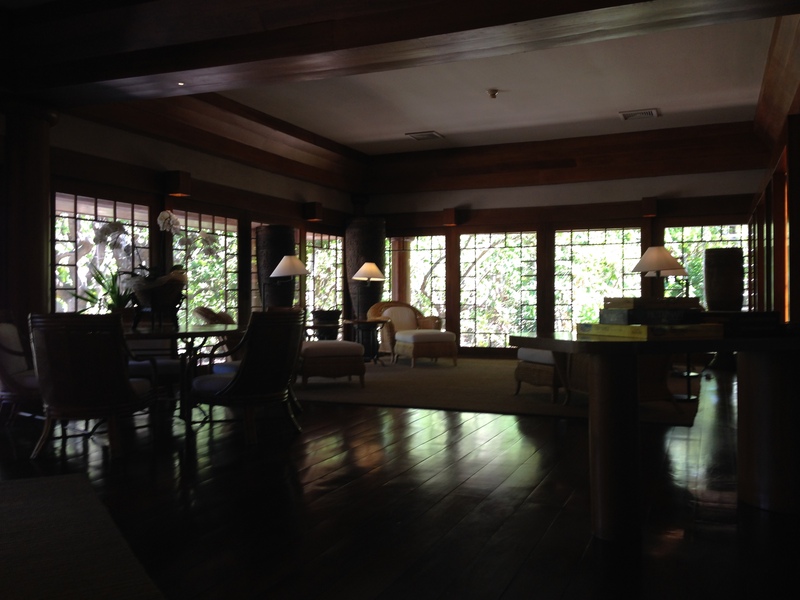 We had our breakfast at the Clubhouse. We chose to have pho noodles for breakfast which we thought were too expensive. Quite the first letdown because the taste didn’t match the price of the pho at Php900 a bowl. Luckily, anything from the breakfast menu was part of our package so it didn’t feel that much a waste of money. We knew then we’d try other items the next day. After breakfast, we headed back to our casita using the Club Car assigned to us. We spent much of the day under the sun; weather was perfect and we were left enjoy the island seemingly all to ourselves. Our casita had already been fixed and tidied up right when we got back to it after breakfast. We brought our own speakers to the beach, streamed straight out of Spotify, 8tracks and iTunes Radio using our mobile phones. Signal was either 3G or H+ (not LTE) but streaming was seamless with no need to buffer. Even videos played seamlessly. 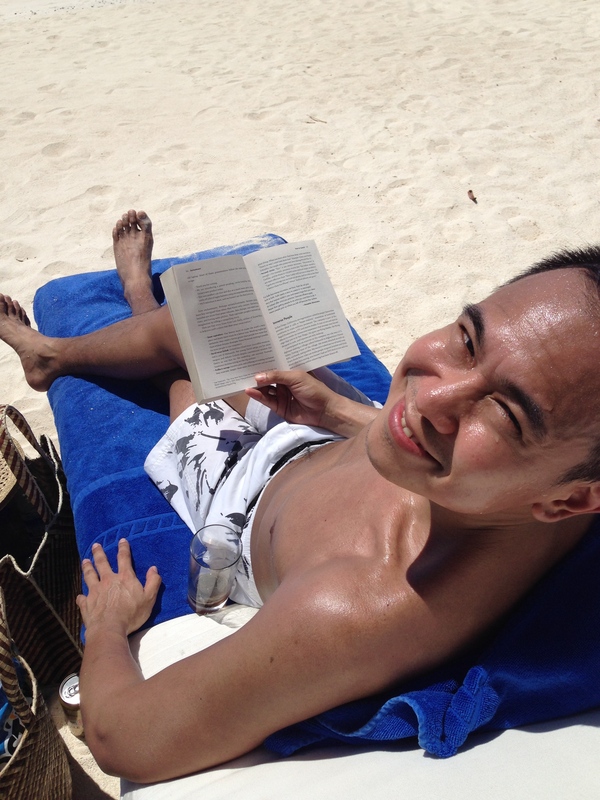 With a book, tanning implements, and Jack Coke and beer in hand, we were set to bake happily under the sun! Rhex’s book for this trip: Enchantment by Guy Kawasaki. What’s happy without a jump shot? We had lunch back at the Clubhouse. Well, actually more like snacks. Whenever Rhex and I are at the beach, our meal times are off by three hours. So we had lunch at around four in the afternoon. We discovered what we consider the best (yet most expensive!) 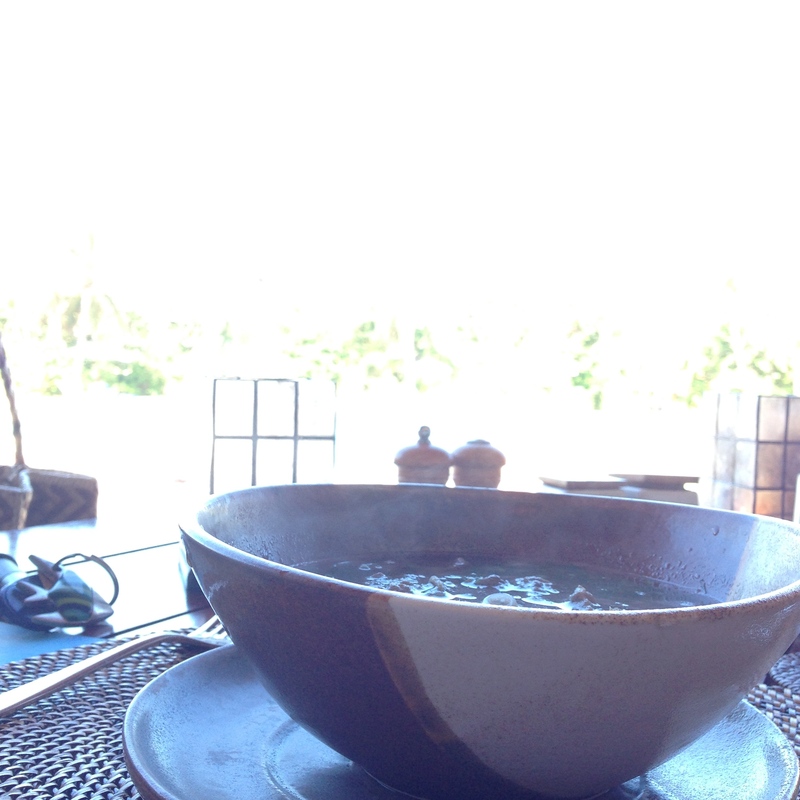 batchoy in the country at Amanpulo. Forgot to take a picture of it, but at Php800 per bowl + 22% surcharge and tax, they exert effort to make it worth your money. Their batchoy is yet the most complete batchoy meal we’ve ever had. 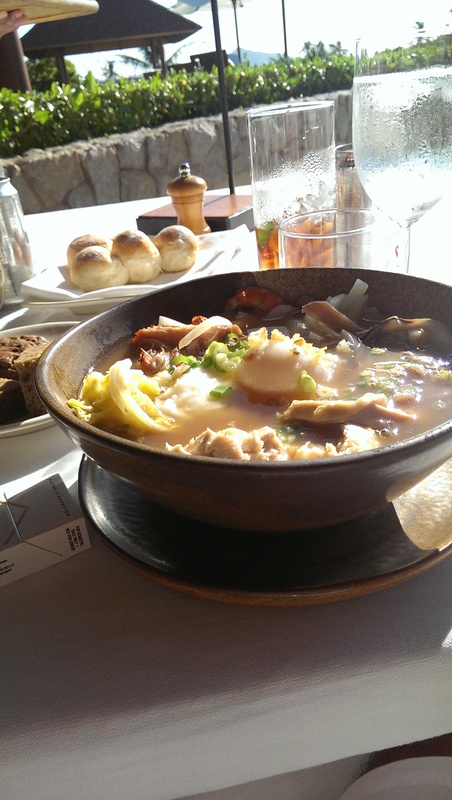 With squid, lechon, pork cracklings, egg, chicken shreds, and veggies + the rich broth, this batchoy is a complete meal. We loved it. 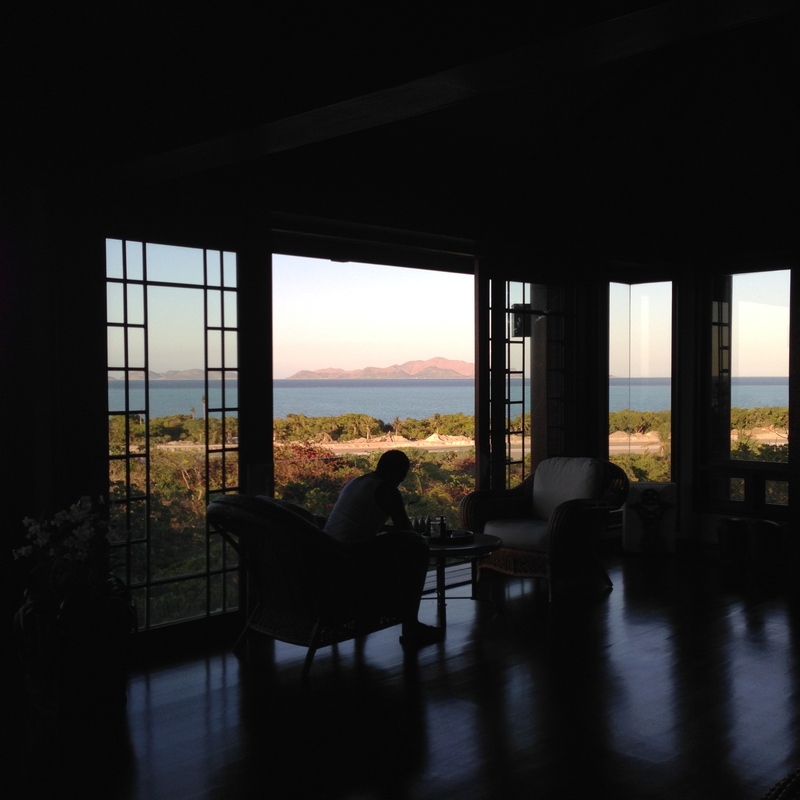 We then returned to our casita to enjoy the sunset from our bed facing the sea. 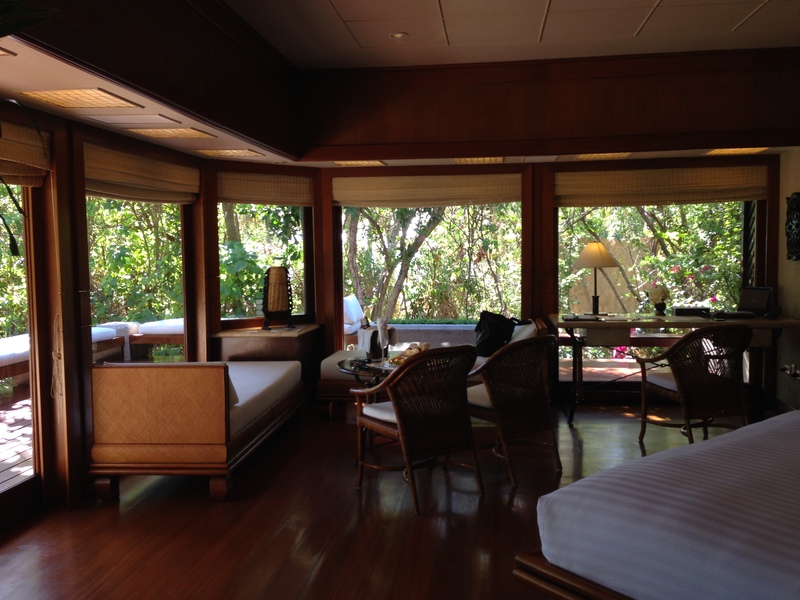 Both walls facing the sea have an unadulterated view of nature making it the perfect venue for lazing around. 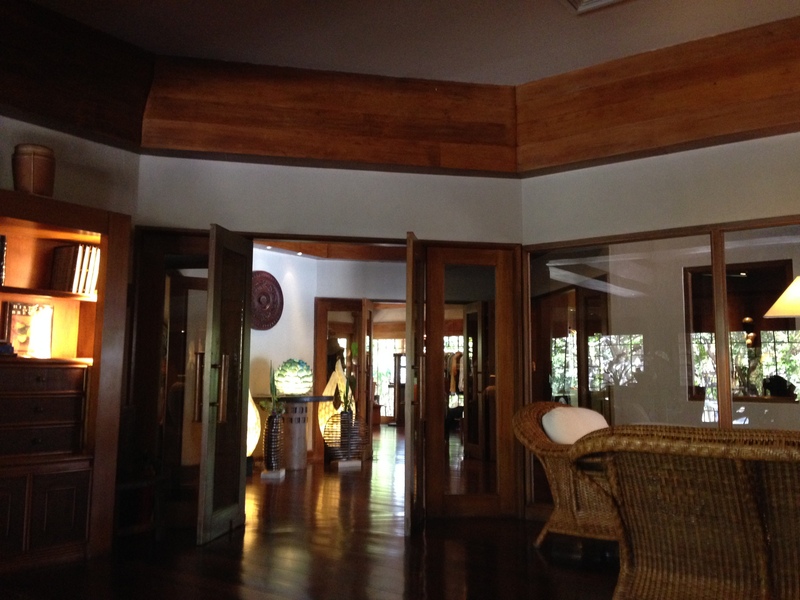 These casitas were designed by world renowned Architect Francisco Mañosa, the same architect that designed The Coconut Palace and boy he has a fine taste indeed. These casitas do not scream luxury, but keeps the design temperament subdued, classic and yet so very refined. You will not see any of those tacky designs that most pretentious places have nowadays. Each casita has a Samsung Smart TV, a Bowers & Wilkins Wireless speaker that you can use to Airplay your iPhone to via the dedicated wifi hotspot per casita. We actually brought our Apple TV with us hoping we could use the lazy hours to watch Netflix or Hulu Plus, but the internet connection was too slow for it. We tried watching Frozen which we bought from the iTunes Store, but it said it would take forever before it started playing. So we chose the luxury of doing nothing until the sun gave way to the night. 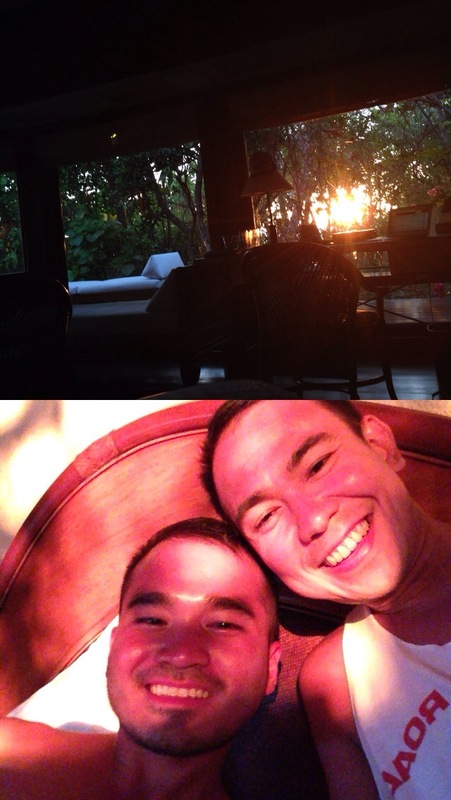 And here’s a token shot of the sunset taken using Frontback on iOS. Not bad especially if you want to capture the moment and a selfie (or twofie) is too limiting. The resort has a way of making you lazy — we just wanted to stay indoors and enjoy the casita all to ourselves so we asked their private dining service to just bring our dinner to our casita. 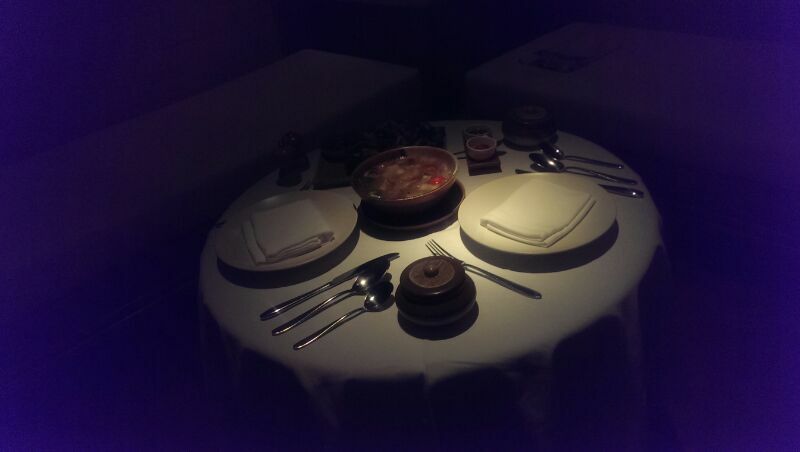 They came in and set the table properly with everything you’d expect to see in a fine dining restaurant. Our dinner this time was equally sinful as last night’s lechon because they’re serving our recycled lechon which they turned into sinigang. We also ordered crispy pata for dinner. We are Pinoys like that — still eating Pinoy even when there are international options. Sinigang was awesome. It’s the kind of sinigang you know was not cooked with instant Sinigang mix. It was cooked in tamarind and lemongrass. Broth was thick and yummy. Crispy pata was yummy, too. Here are panoramic shots of the main room and our casita’s bathroom. Just outside the room is a patio big enough to host a party of about 10-15 people. It has provision for up to three daybeds which are also great spots for getting sunkissed albeit in a different setting as this one is right next to what feels like an unkempt forest. You will hear game making sounds, birds tweeting which perfect accompanies the smooth sound of the breeze interspersed with the rhythmic whisper of the waves hitting the shore just beyond the trees. 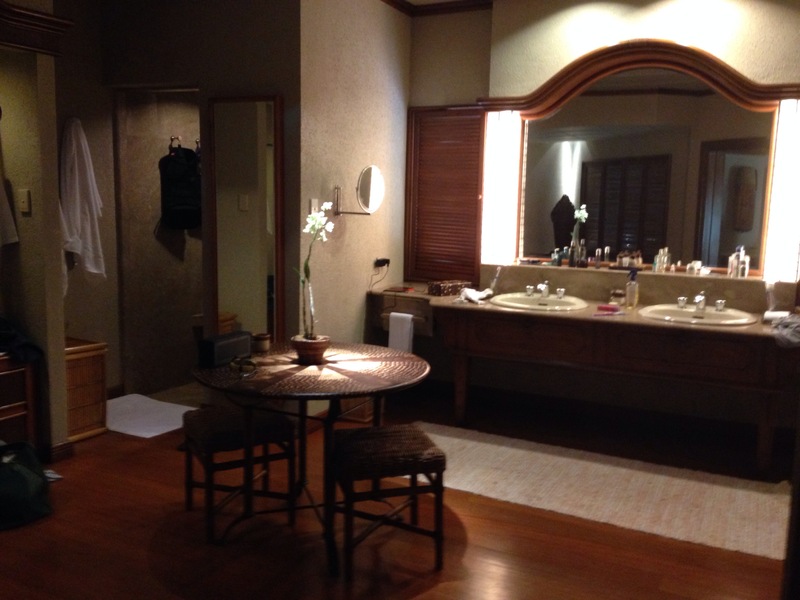 Like I said earlier, bathroom is almost as big as the main room itself. Well appointed with Cebu marble everywhere, you have everything you’d need to pamper yourself here even without going to the spa. This is our beachfront. 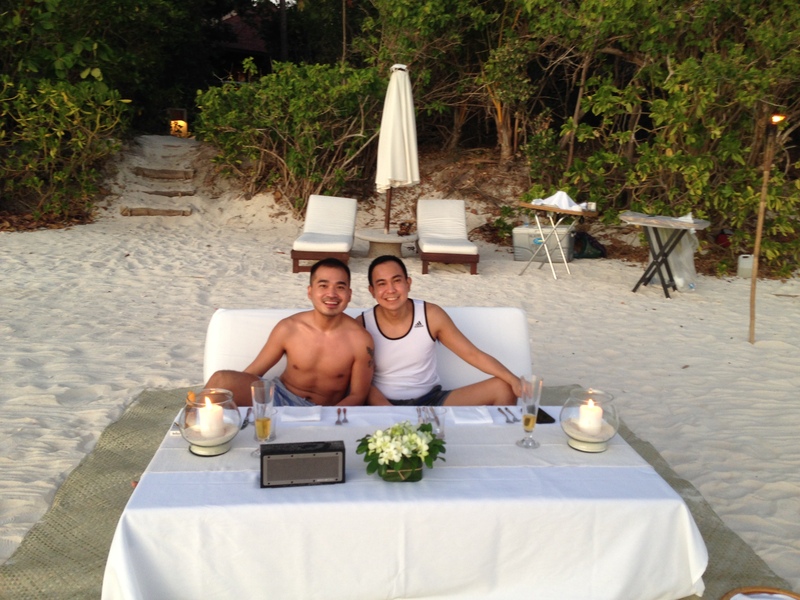 What I love about Amanpulo especially their beachfront is that they’ve made every effort to not make it look polished. As most places here in the Philippines, like even the best restaurants in town, there’s an irresistible temptation to make things look commercial robbing the place of idyllic charm. 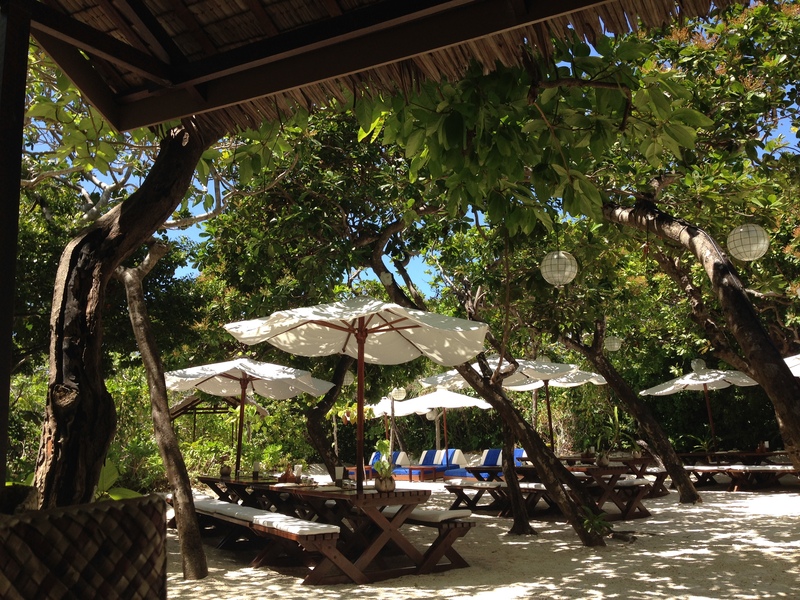 Amanpulo has kept the front as natural as they are whilst of course keeping the place as pristine and neat as possible. All beach casitas and Aman villas have direct access to the private beach but are well spaced from each other giving you that feeling that nobody else is around. We would see some couples walking by once in a while but they disappear as fast too. Some would take a dip for a while but then they disappear as well after a while. 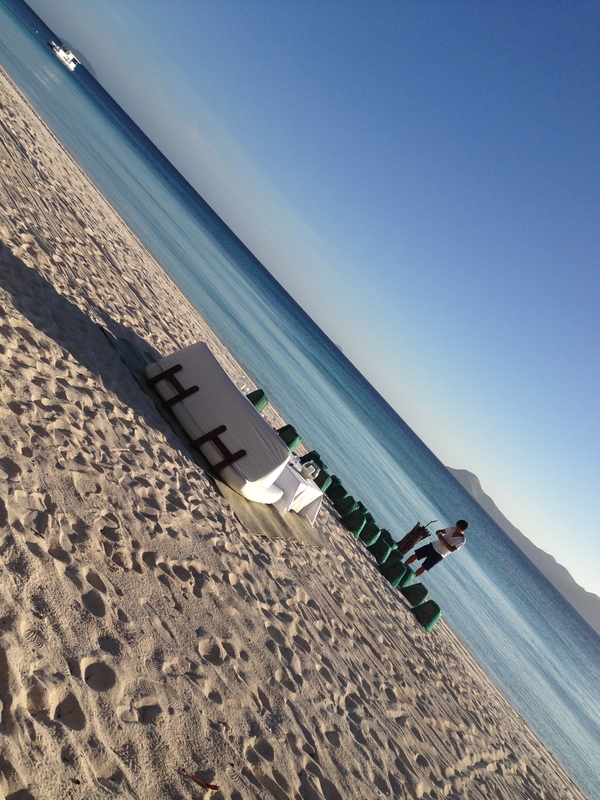 This place gives you what Boracay doesn’t. Here you can be confident that nobody else is looking at your demeanour or at your physique gone bad after swallowing one whole lechon de leche. Here you are alone with your loved one and you are left to enjoy the beach without care. We spent most of the day in the sun again. Rhex continued reading his book whilst I spent most of the time going back and forth the lounge chair and the umbrella to change playlists. I have to say, I couldn’t imagine going on a beach trip without music. Technology has made music so accessible these days that you can stream from almost everywhere. Couple that with a nice water and dust resistant speakers. Rhex bought a Braven 855s speaker for this trip which was a good idea because while the Bowers and Wilkins speaker inside the room has Bluetooth and Airplay features, it still wasn’t portable. We also kayaked from one end of the island to the other, which wasn’t so tiring because the entire length of the island is just 5 kilometres. I thought it would be hard to paddle — have never done it before — but it was like working out which was good since I’ve been on and off gym for the past weeks. Rhex took care of turning our boat. We also used this chance to balance our tan, so we faced the sun and spent some time with back against the sun. We also joined a small group from the Beach Club. 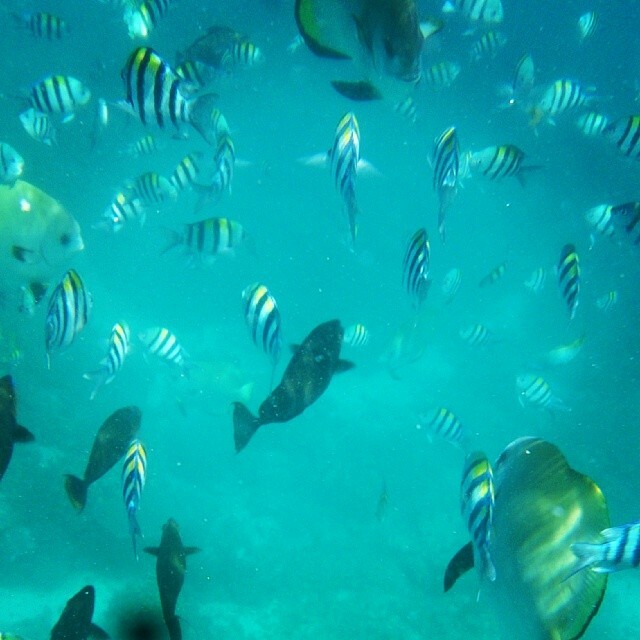 We were brought to a reef which was teeming with a lot of fish we fed with bread crumbs. We were also able to spot a giant turtle feeding at the bottom of the sea. What a lovely sight! See the video here. 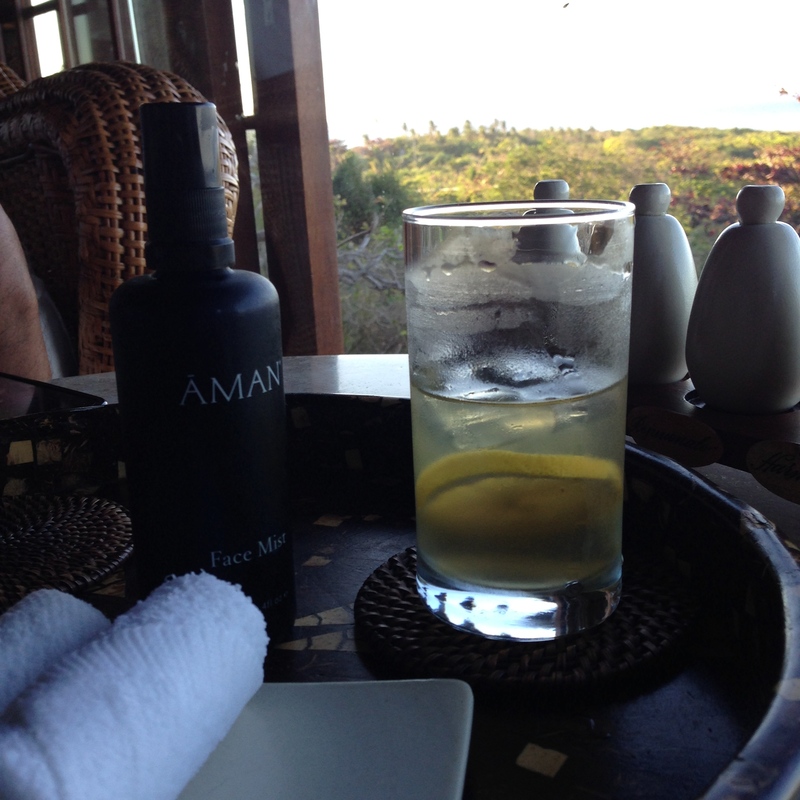 After much sun, we went to the Aman Spa that’s nestled on a hill in the island giving you a sweeping view of the Sulu Sea. Most reviews recommended taking the Pulo Signature Massage, which luckily was part of our package, at dusk for a more memorable dramatic view of the sea against the setting sun. This spa is the benchmark of what spas should be. 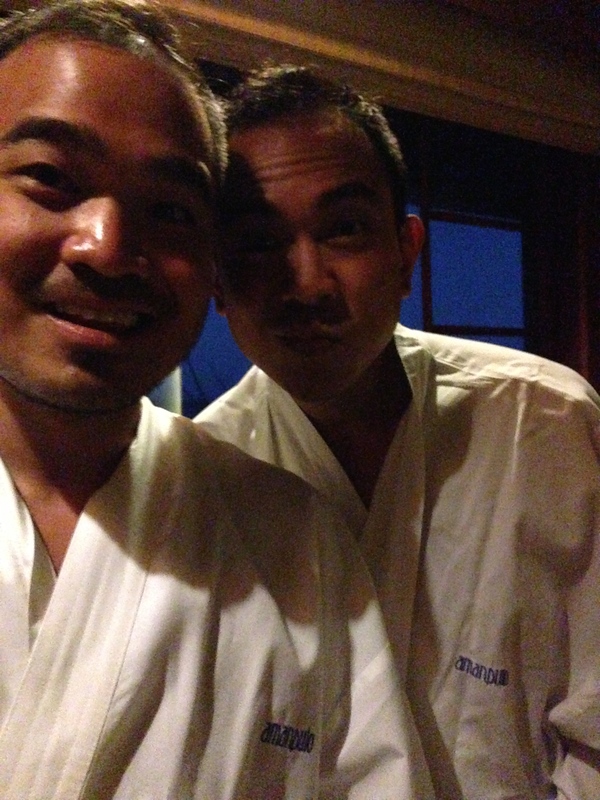 We were served with cold lemongrass and pandan infusion, Aman face mist and frozen towels to freshen us up before the therapy. Our therapists were excellent. They used our chosen aromatherapeutic oils. I chose the energise oil whilst Rhex chose the relaxing oil. 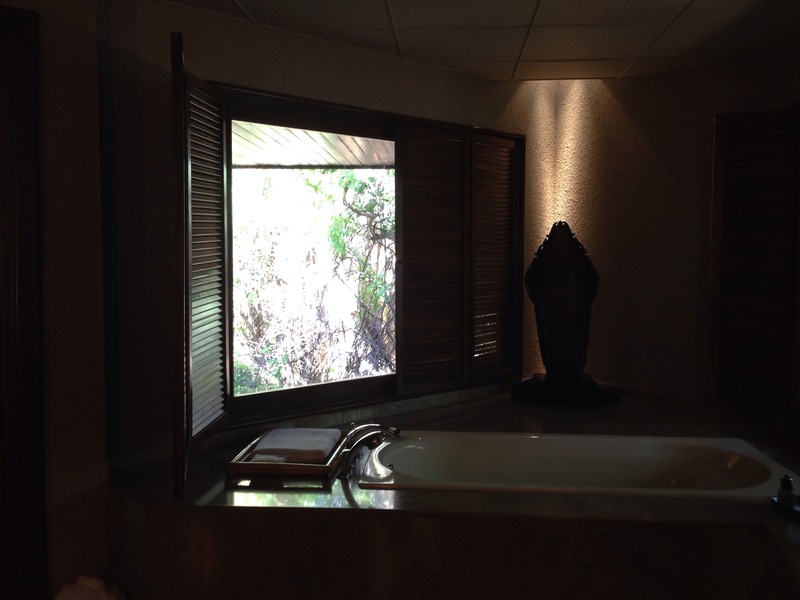 Each therapy room has a soaking bath, a shower and toilet, and two massage beds for couples requiring that much needed pressure point + hilot + Swedish massage. Ambient music ranged from nature to classical which was definitely relaxing because it was fused with birds tweeting and geckoes tokay-ing outside. I remember when we were leaving the Clubhouse earlier that day, one of the guest assistants ushering us back to our Club Car was so excited to remind us of our massage at the spa. We were puzzled because she looked kilig to tell us of our massage. 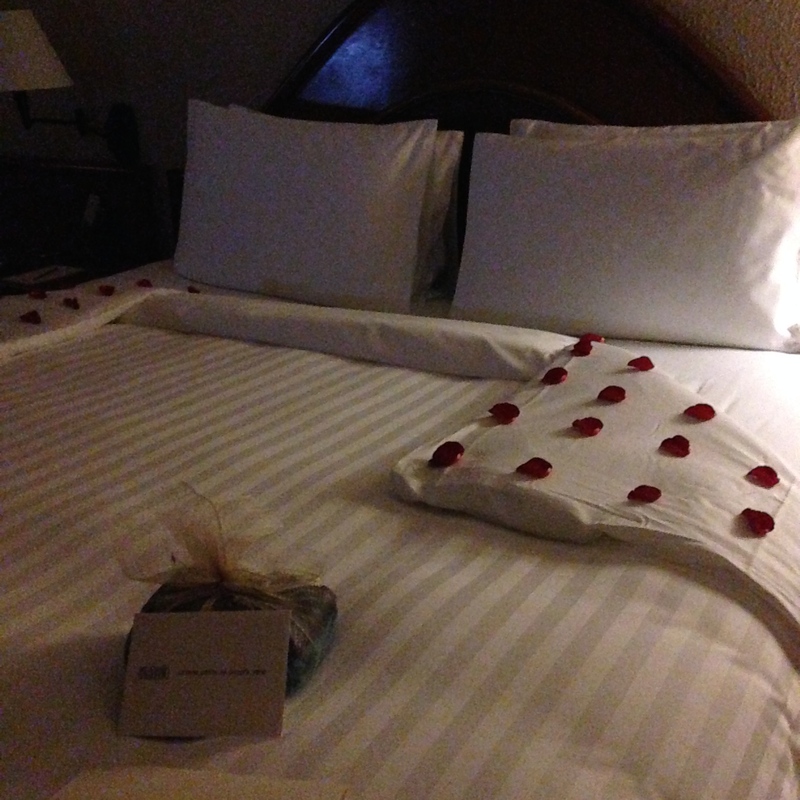 Little did we know that they were going to use that time to give us another surprise, this time a romantic turndown service. 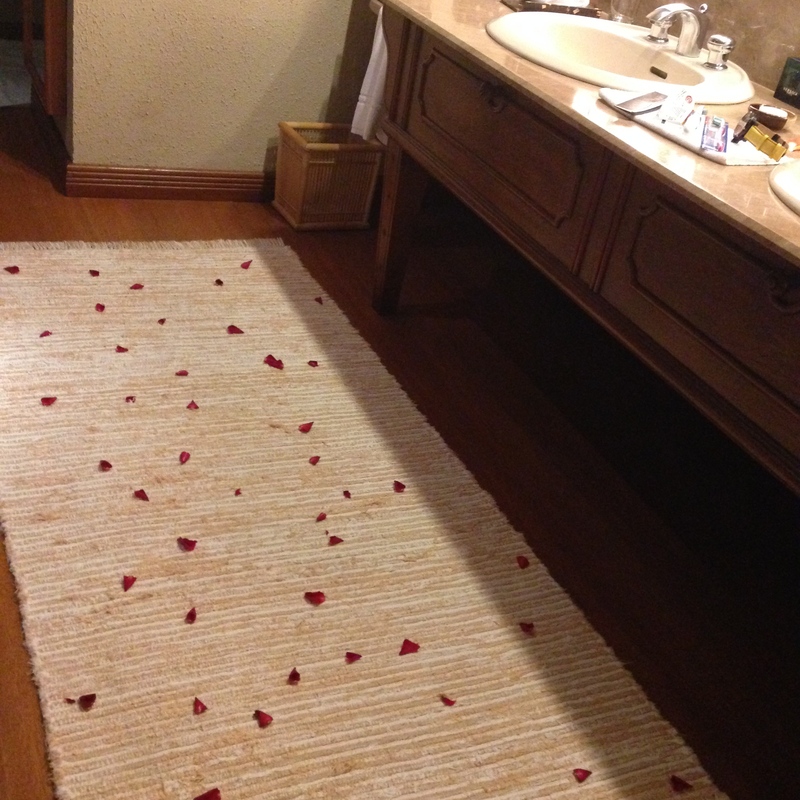 When we got to our casita back from the spa, we were surprised to see the entire casita peppered with roses from the bed’s duvet, the bath tub which was filled with bubbles too, and even on the rugs. 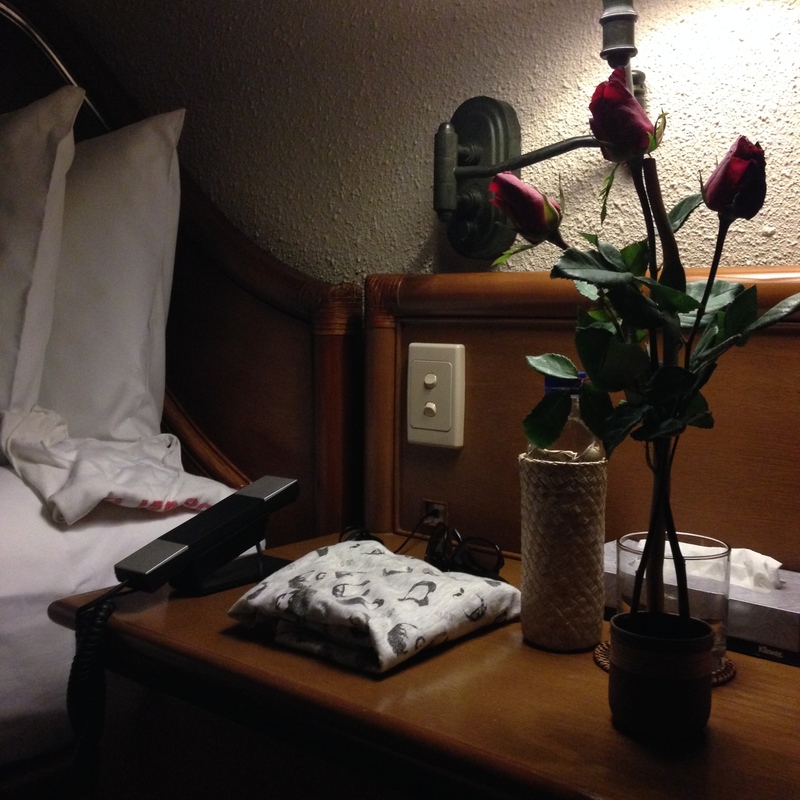 They even placed three red roses on the bed side. 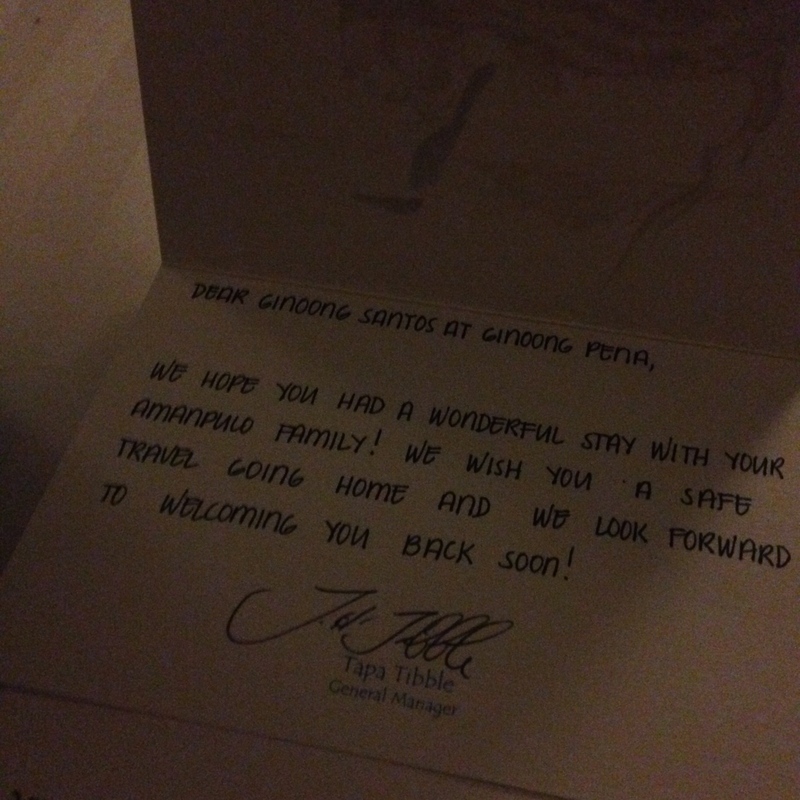 On our bed was a note from the Tapa Tibble, the resort’s General Manager, which came with a gift for us. We opened the gift and it was a pair of their service staff’s Amanpulo-branded shirt. One was in black and another in blue. We don’t know if they have some sort of intelligence reporting system, but we did visit the boutique earlier that day and checked out these shirts. Another wonderful detail is that they got our size right. It was so thoughtful of them to even give us a going away present when they have already given us a Php 7320 bottle of white wine, an Aman Spa treatment for two, full breakfast (order anything from the breakfast menu), and pampered us with so many little details. Rose petals were a nice touch, the shirts were equally surprising. 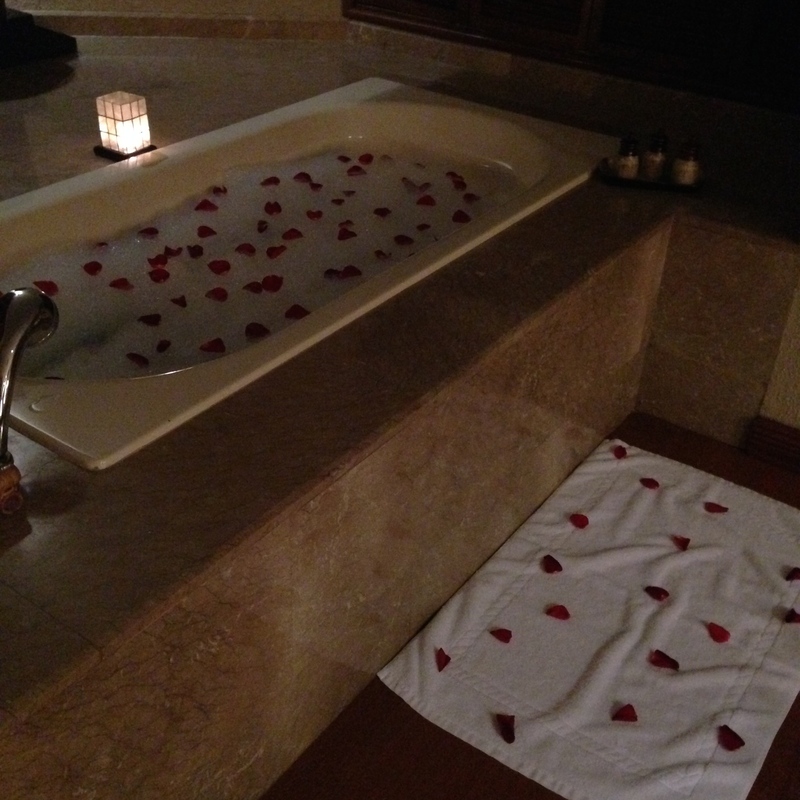 And once again, the Moities were lazy to go out after soaking in a petaled bubble bath. We decided to stay in and order food from their Thai restaurant. There’s no extra surcharge for ordering food into your casita. So that’s an awesome deal for people who wish to just stay in. Once again, they made it worth every penny spent on this dinner. We actually ordered beef curry, tom yum soup, and grilled minced pork. But they gave us more than what we ordered. 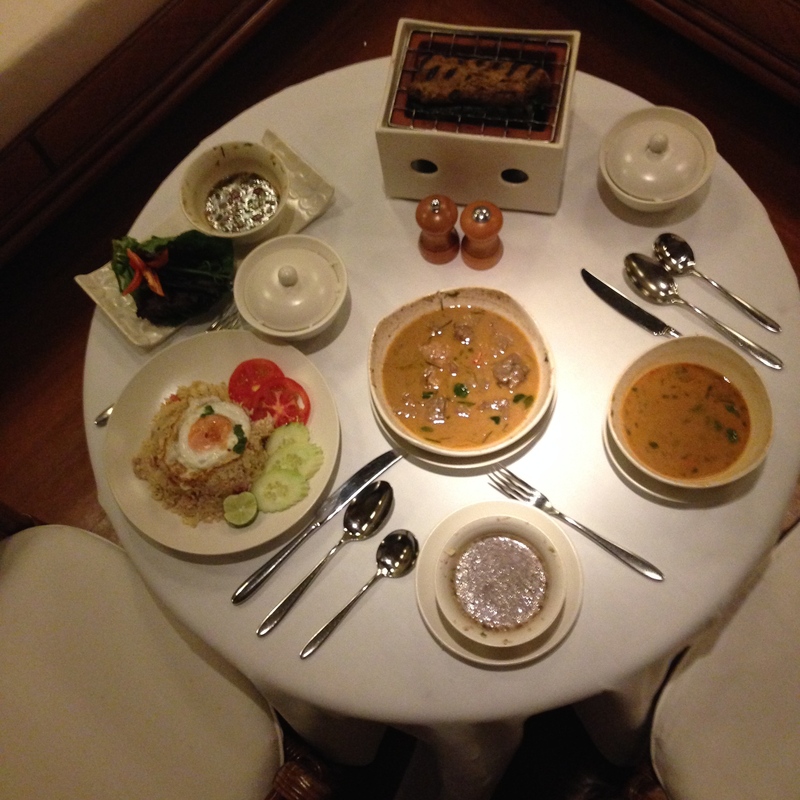 It came complete with a Thai salad and another soup to complement the meal. They even brought an indoor grill to complete the setup. Most room service just bring the food to your room without the fuss, here they take the extra fuss to make it worth your while (and premium money). 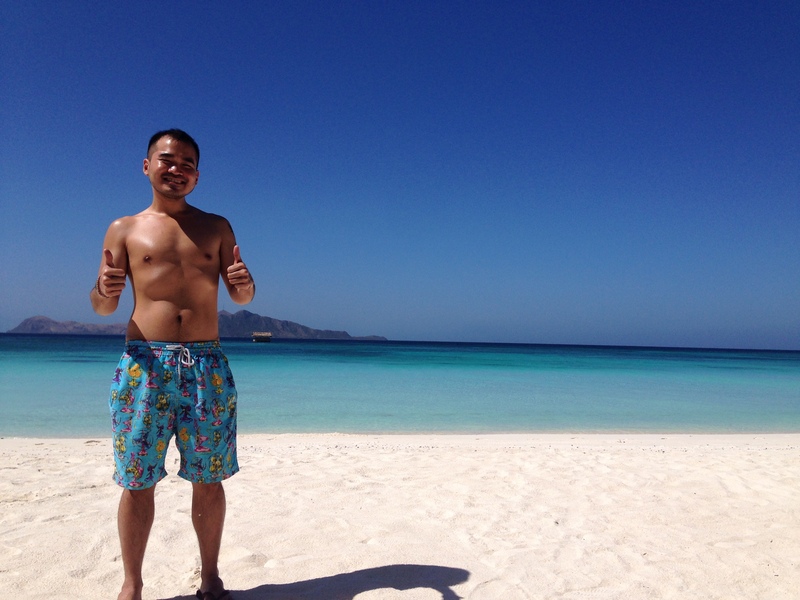 When in Amanpulo, it’s great to be a lazy person because they will feed your laziness with priceless experiences. We woke up the next day — and it was time to go home. 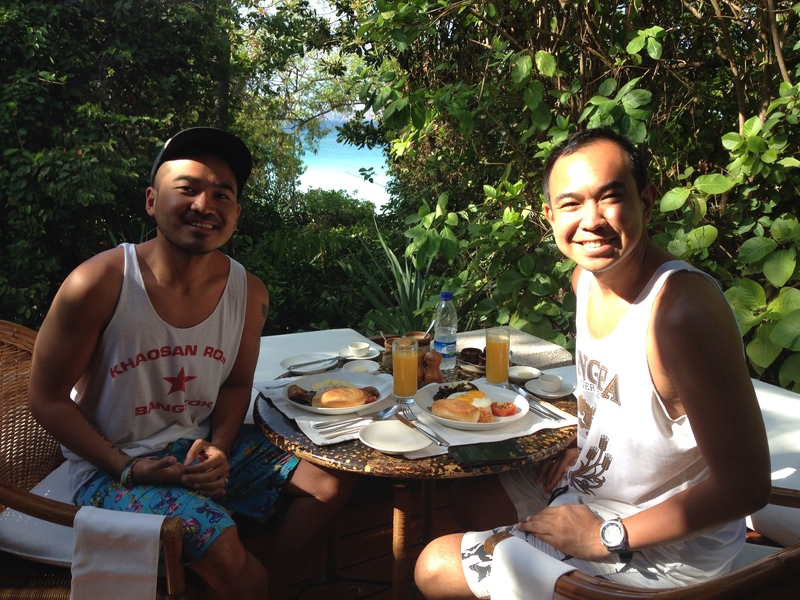 Since it was our last day on the island, hours before our flight in the afternoon, we requested for our breakfast to be set up at the patio to really soak in the splendid view of the sea peaking through the trees. Here’s one for attention to detail. 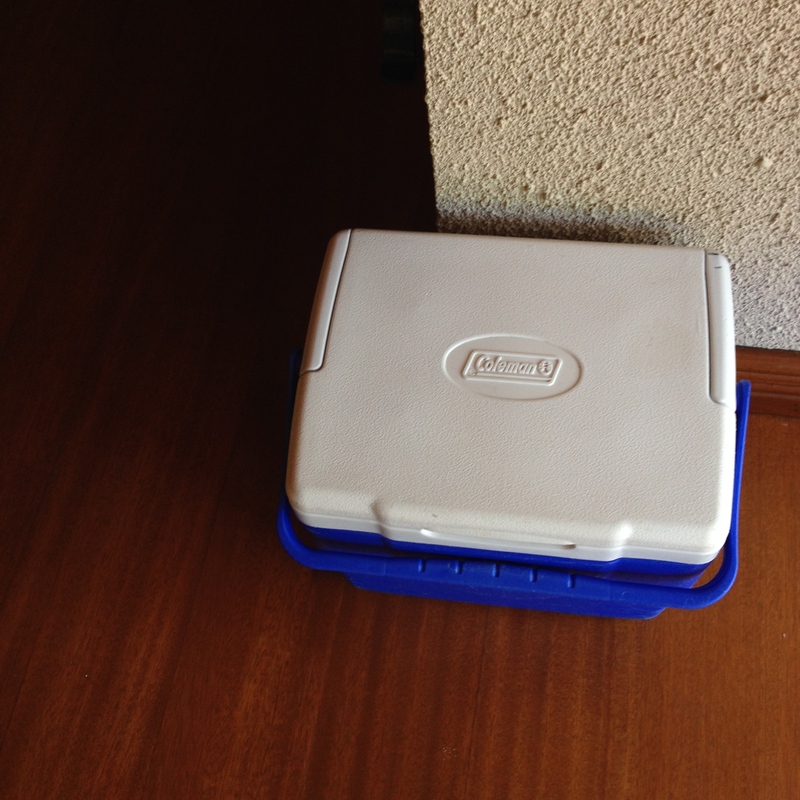 We requested for an ice bucket for our drinks and since we were technically outdoor they brought us a cooler. It was time to say goodbye to our casita. 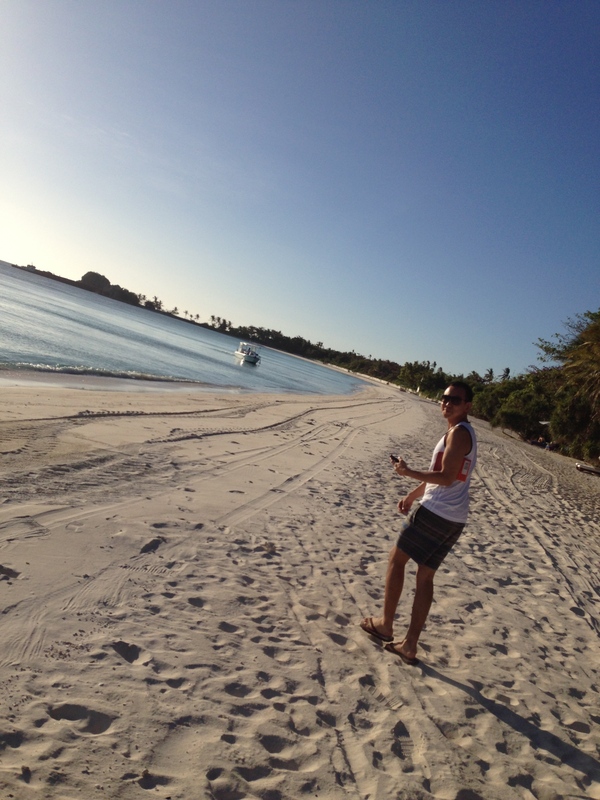 It was kind of sad having to leave such a beautiful place filled with memories Amanpulo has made wonderful. 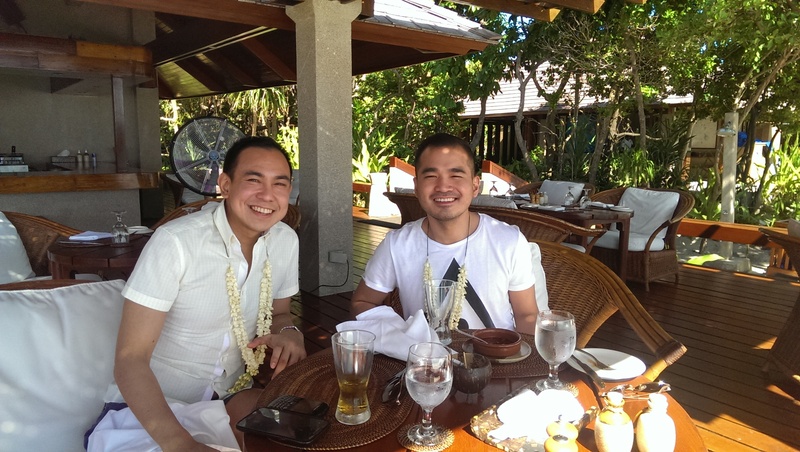 We also chose to wear the Amanpulo shirts they gave to us since we were running out of clean tops. We had our lunch at the Picnic Grove for their famous thin crust pizzas. After we gobbled up two pizzas, we drove to the Clubhouse to check out. We were ushered to the Library, which Jay, our guest assistant, recommended because it was cooler there. After a while, I wondered why we aren’t seeing other guests come; I was wondering whether it would just be us flying back to Manila. So I asked where the rest were. Jay said we have other company and true enough they were just in different spots at the Clubhouse. We then realised that it was their way of making your experience still feel exclusive — they deliberately separate parties from each other so you do not have to feel you are with other people. You would only have to hang with them in the plane, not at the resort. So we had the Library all to ourselves playing sungka for about an hour or so. Their library has an extensive collection of coffee table books about the Philippines and a collection of DVDs for kids and adults. They also have some boardgames. All of these you may borrow and bring to your casita for your personal enjoyment. We then went to the holding lounge just right next to the resort’s own airstrip to wait for our plane which was arriving from Manila. Here we saw their routine in preparing for the arriving guests. One by one, Club Cars were lined up in the periphery of the airstrip. Guest assistants review the scanned IDs of their arriving guests, constantly taking them out of their pockets and back, preparing the sampaguita garlands as well ready for them to present to guests when they land. The front office manager, Nathan Vasallos, and the GM, Tapa, appear as well greeting departing guests and ready to welcome arriving parties. True enough, in a matter of minutes, plane from Manila arrives and the entire staff and their managers come to greet the guests. After a few more minutes we were ushered to the plane. Some of their staff later on joined us in the plane, they probably have errands to do in Manila. 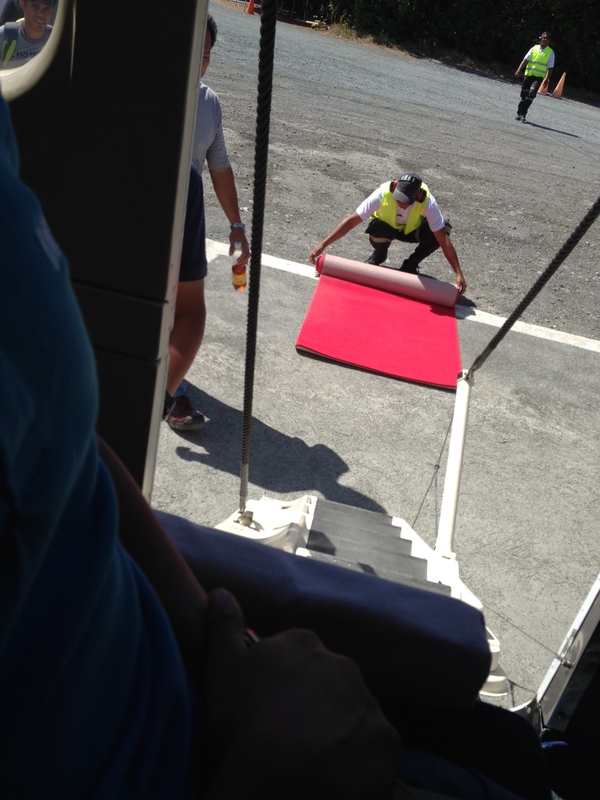 Then the red carpet was rolled back by the ground staff. It was time to say goodbye to the best island getaway in the Philippines — perhaps in the World — and I was half sad and half happy. Sad because the island is so pampering and you will soon be zapped back to reality. Happy because you begin to create memories of a future trip by imagining what it would be like when you return or even by musing about other Aman destinations in the world. When the plane was about to take off, you could see the staff including the GM, other managers wave goodbye to you. It is indeed goodbye, at least for now. See you again, Pamalican. – Everything is invisibly orchestrated. You do not see the many things they do in the background, but they make your experience of the bits and pieces of the island seamless and beautiful. – They know that everything on the island is expensive, so they try their hardest to make it worth your while like throwing in a few delighters along the way. 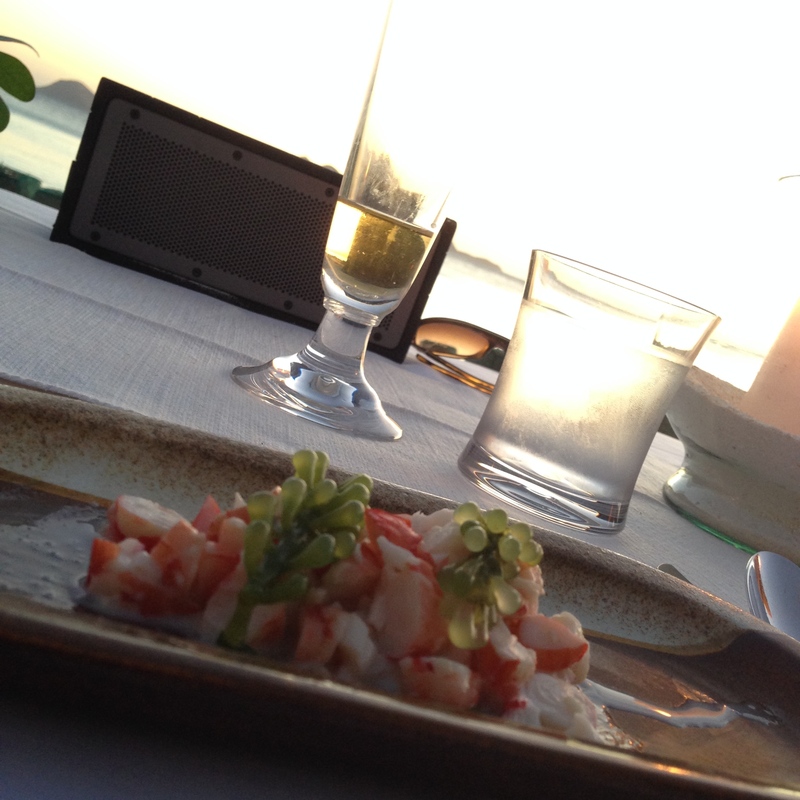 – Elegance and luxury in this resort is subdued, classy and nothing tacky. 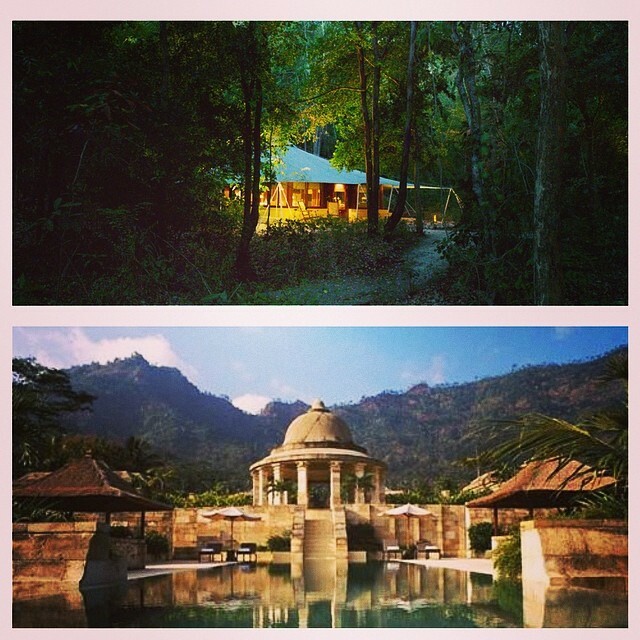 – They see to it that you leave feeling pampered, rejuvenated, and inspired so much that you begin to imagine how it would when you visit again or how it would be if you book in other Aman resorts. – They embrace whoever you are and let you be. They celebrate your occasion with you. – It is expensive for most people like us; but it is worth saving for. – It makes you fall in love doubly so; and it makes you love the Philippines all the more. 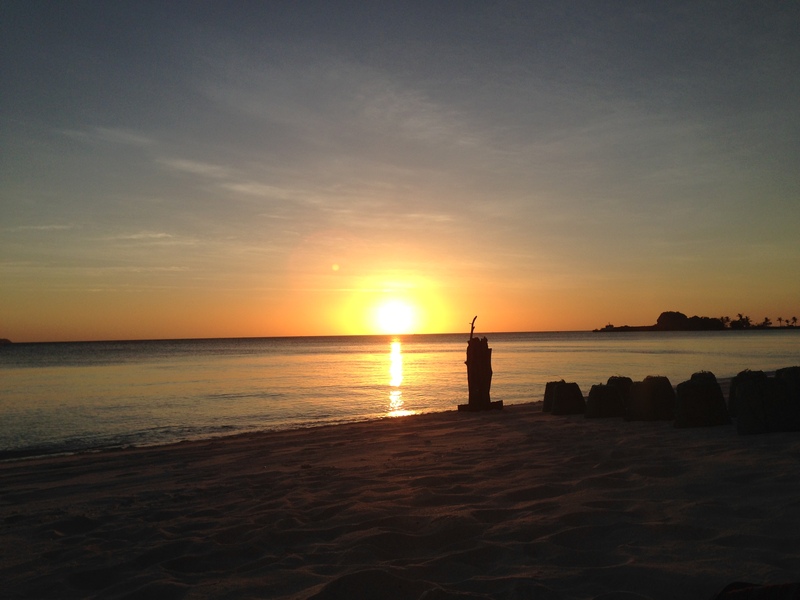 Thank you, Moitie, for the wonderful memories at Amanpulo. Until our next adventure! Maybe Amanjiwo or Amanwana. Let’s see. Moities Forever. The world over. 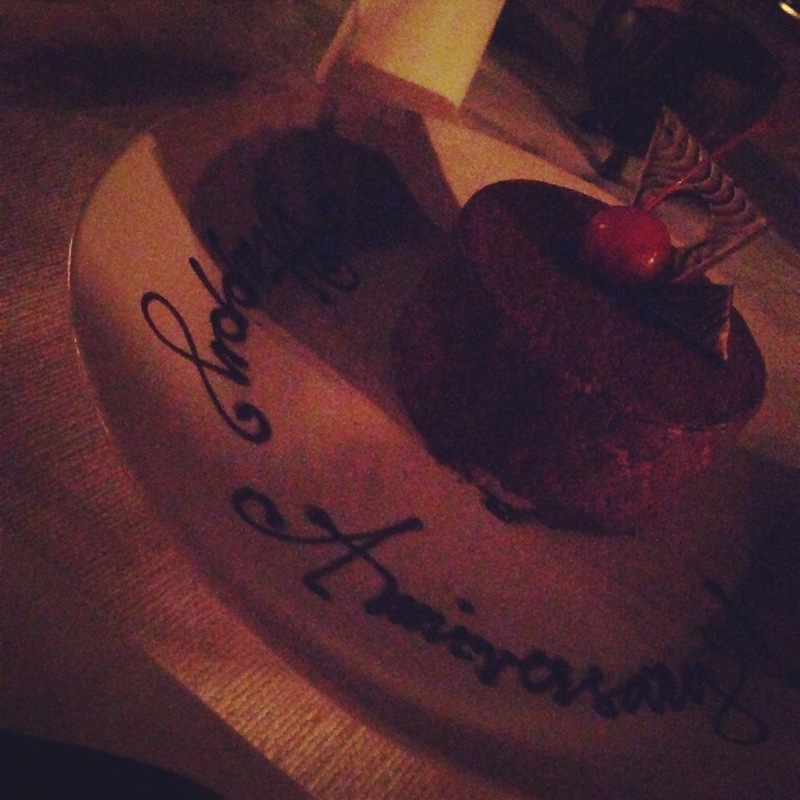 Happy 4th anniversary, Moitie!